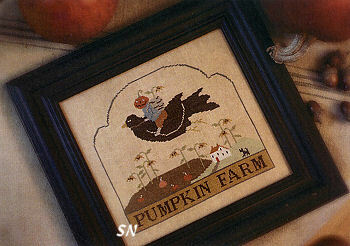 For your convenience, we have grouped all of the Punch Needle designs down at the bottom of this page. Click here to go directly to them. The second chart in the series will release in late April or early May and celebrate The 4th of July. Spring Fling - Pink hand-dyed linen -- approx 10 x 6 on 32ct... we love the colors! 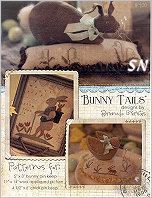 Mrs Bunn E. Tail - What a darling bunny! 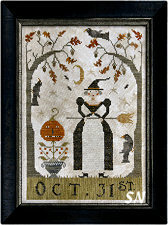 71 x 106 in stitch count, she is worked on 36ct or your favorite fabric! Hand-dyed flosses. Where Liberty Dwells - Two cushions - small is 95 x 72, larger is 111 square. Pretty hand-dyeds, both charts are in this same pack. 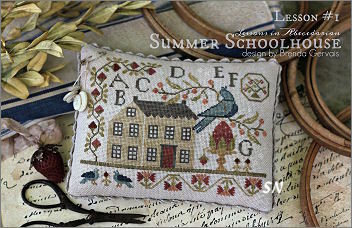 To Quote Shakespeare - *And in a tedious sampler sewed her mind* Just goes to show that Shakespeare knew NOTHING... if he thought samplers were tedious! 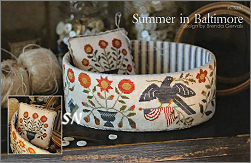 Another paper mache' box finishing treatment like Brenda's Seasons in Baltimore, stitch the outside band and mount the fun quote inside a 3-inch hoop - or make it into a cushion! Both designs are in this chart. Prairie House Sampler - The Gilmore Weaver's house is in this one. Pretty blues and taupes, this measures 195 x 135. Note: Brenda is using trays from papermart.com supply and ordering info for each is included in this chart. 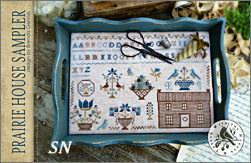 Quaker Sewing Tray - We love this little piece! Just 89 stitches square - it's only 5-1/2 inches square on 32ct! 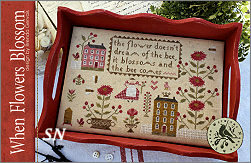 When Flowers Blossom *The flower doesn't dream of the bee, it blossoms and the comes* Finishing approx 12 x 8 on 32ct... lots of cute motifs in here for make some smaller pin cushions as well! 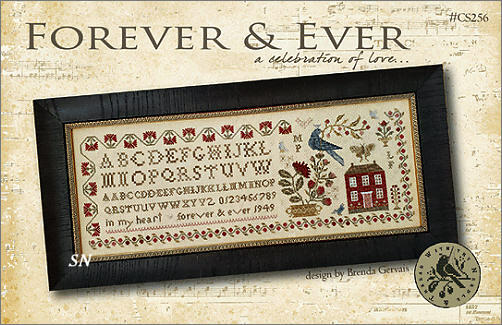 This is a wedding or anniversary sampler! *In My heart -- forever and ever. * Initials are in the design and since 1949 is there as the date... it can be both! Stitch count is 336 x 113 - so a whopping 21 x 7 on 32ct! 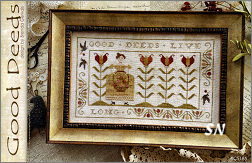 BUTTTTT... Brenda also includes a cut-down version of the piece - just the right-side of it, with a new charting of the floral border. Very pretty! A Fresh Shipment of Stitch Dots! 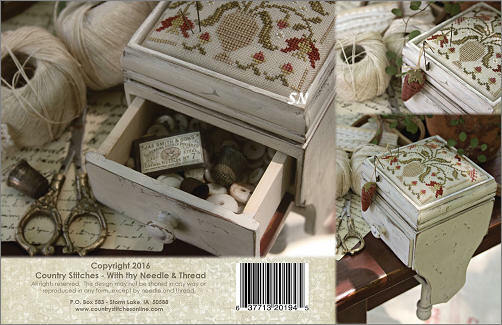 We chose some of our favorite Stitch Dots featuring the artwork of With thy Needle's Brenda Gervais for our most recent shipment. Cute little super-duper-strong rare earth magnets make these dots very functional. Strong enough to hold a pair of scissors nearby or keep track of multiple needles, they work as good old-fashioned refrigerator magnets as well as needlework aids. We carry lots of varied Dot designs... we usually just 'assort' them if you order the '3-For $30 Special. 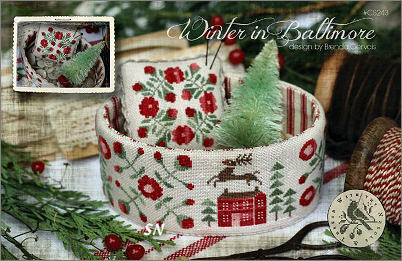 Winter Releases from With Thy Needle & Thread! 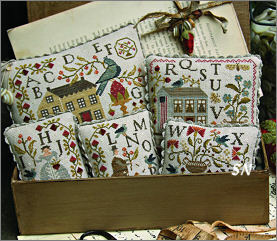 Winter in Baltimore finishes this quilt-inspired 4-seasons set of tiny box designs. 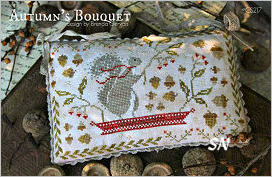 Stitched over one on 28ct Mushroom Lugana all the motifs make cute pin cushions if you aren't into box finishing! Flosses used are Linen, Maple Syrup, Blushing Beauty, Lady Bug and Poblano Pepper. 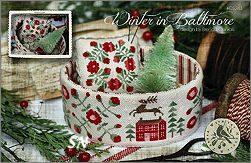 Basketful of Winter Time - A finish to the 4-part 'basketful' set, I think the Santa with his reindeer and skinny little tree would make a darling ornament - just by themselves! 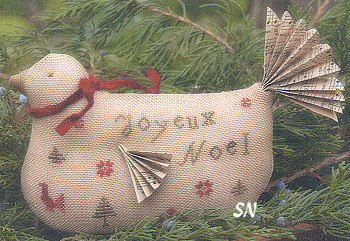 All Bundled Up - This one is cute... even the little bird has a scarf! 186 x 123 in stitch count, the fabric in the pic is kind of on the light-side... you might be able to go darker to see the whites a little better. Candy Cane Wishes is another small oval design that companions Peeps, Santa and Spirits and Spells. Shown as a box-topper - the oval-shaped borders on these are so pretty. 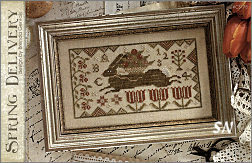 Plum Pudding - More of Brenda's charming mice!!!! This time, the ladies are preparing Christmas treats! They've been cooking up brew for Halloween, making Christmas tea and I think my favorite place they've been is in 'The Sewing Room!' 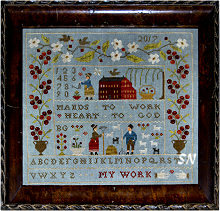 This is the cutest series of designs, this one measuring just 69 x 77 in stitch count. 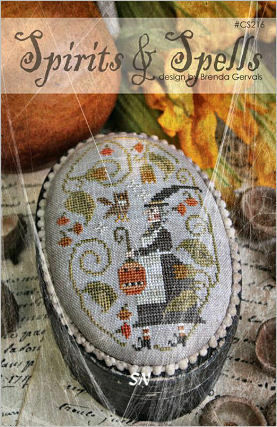 Brenda Gervais has announced a new pattern with little witch mice in their garden of bittersweet. The big 'ol witch shoe might be the 'house' they are Trick-or-Treating!!! Finishing about 5-1/2 x 6-1/2, it'd make a cute hanging pillow over a doorknob somewhere. 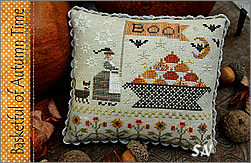 It would also be cute perched as a cushion in that Halloween Candy Basket you might have already started! (You know the one where you buy the Halloween candy NOW, so you'll HAVE it to give away at Halloween... all you find in the trash are wrappers that nobody knows anything about!) The inference of mice in their candy might scare them away! This comes as a chart... hand-dyed flosses. They're here! They are all charts... here's the scoop!!!! Basketful of Autumn Time -- This is the 3rd of a 4-part series. 93 x 83 In stitch count, preferred fabric is Summer Khaki, which comes in lots of different counts. 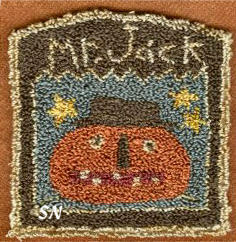 There are a few over-one stitches in the Jack-o-lantern faces, and all is worked with hand-dyeds. No houses in the basket this time around... just that pile of pumpkins! 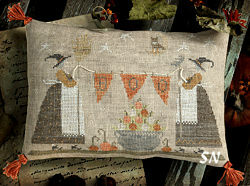 Bittersweet & Broomsticks -- 115 x 90, Super-cute! The golden color of the fabric highlights the flosses nicely on this... but something mangy and gray might be fun too! With Thy Needle's Newest Designs! 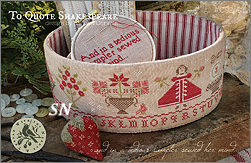 Strawberries & Stripes -- Brenda's second peat pot basket design -- finish this however you like. 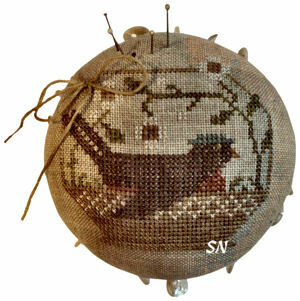 At 47 x 48 stitches in size, it's a perfect pin cushion size. I don't know if you can make it out in the pic, but the bird is holding a flag in his beak. Betsey Snyder -- A reproduction of a simple sampler from 1822, Betsy stitched the letters in her name in a scattered fashion in the bottom half of this, and I bet she had a dog that she dearly loved! 186 x 142, this finishes approx 11-1/2 x 9 on 32ct. 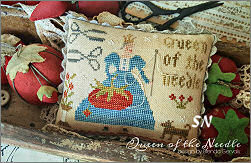 Queen of the Needle -- Well, you definitely have to put your initials on this one!!!! 3 x 4-ish, pretty hand-dyeds, make this one for your next pin cushion exchange at an event! Farmyard Parade -- Ole and Ora Woolson are the Grand Marshals of this year's 4th of July Parade! 70 x 70 in size, they finish approx 4 x 4 on 36ct. 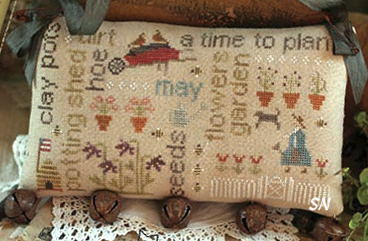 With Thy Needle is sending a new design this week... a pin cushion finished in a little painted peat pot! 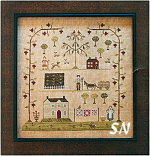 Offered as a chart, this measures 49 x 49 in stitch count, and the finished piece is done on Weeks 36ct Linen. 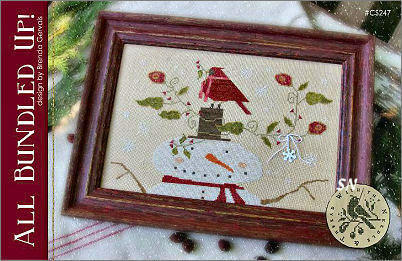 Brenda uses a smattering of various hand-dyed flosses to make this precious tiny piece! She talks about the peat pots ('Jiffy' brand at WalMart JP312) that are available (in season right now) in garden stores. She plans on doing more designs to finish like this one... so buy the pack of 6 pots -- not just one! She's taken that pot, painted it and added some crepe paper as a trim -- those items are described inside the chart in her finishing instructions. Just a sweet springtime basket of flowers -- for you or someone special... do the peat Pot thing... or whatever YOU want! 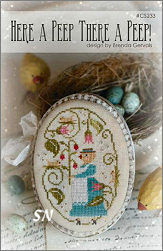 Brenda Gervais is introducing 11 new designs at Market next week! 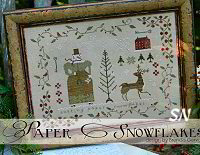 There are two new series of Seasonal charts, and some new 'people' Brenda will start to feature in some upcoming designs. All of these are presented as charts. The Basketfuls -- 4 Seasons of basket designs in chart format. Spring and Summer arrive next week... Autumn and Winter come later. Finishing approx 4-1/2 x 4 on 40ct. Note! There is ALSO another title, CS106, Basketful of Spring, by almost same name... just so you're aware! Hen & Chicks -- Cute little 3-1/2 x 5-1/2 pincushion. 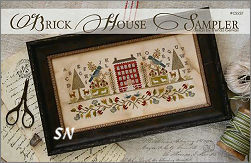 Brick House Sampler -- Same colors as the Summer Schoolhouse ABC series, Brenda stitched this on the same 28ct Lugana, so it is a COMPANION to that series! Blessed Bee -- Lots of bees in the garden! Finished size is approx 5 x 5. 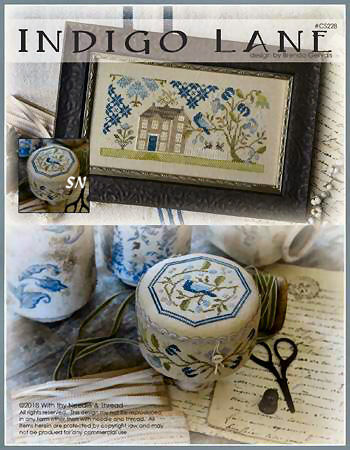 Indigo Lane -- Oh all blues and taupes, chart includes patterns for both designs -- picture and trinket box. Here a Peep, There a Peep! 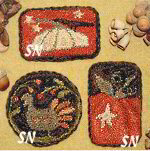 -- The 3rd seasonal in this set -- remember the Halloween and Christmas ovals? 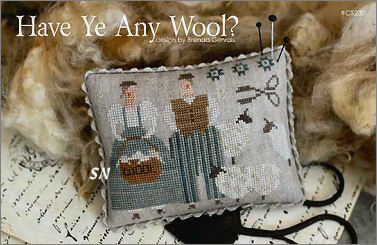 Have Ye Any Wool? 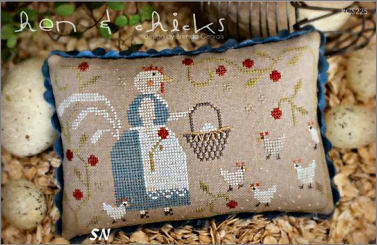 -- Pin cushion 4-1/2 x 3-1/2, it features soft denim colors and Ole and Ora Woolson! Welcome Spring -- Fun smaller pillow, this finishes approx 7 x 3-1/2... aren't the little blue spotted eggs in the wagon cute? 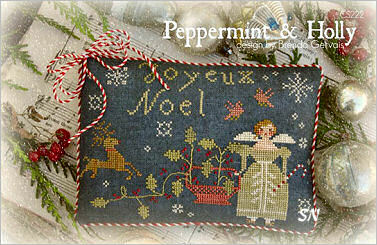 Peppermint & Holly is a sweet Christmas Angel gathering her holiday holly. Worked on Weeks Dye Works 35ct Twilight Linen, choose something dark. 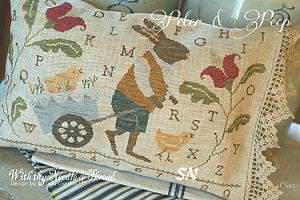 Lots of the various dark grays or chalkboard-colors in both linen and aida will work beautifully. Stitched with a smattering of Weeks flosses... that striped cording (not included but readily available online) adds the perfect finishing touch! Love the red/mossy/gunmetal color scheme!!! This finishes approx 5 x 7. 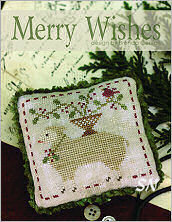 Merry Wishes - This is a little sheep decked out for Christmas! His festive little holly bow and that pretty basket on his back... this is presented as a small chart, with the design finishing ornament-sized at less than 3 x 3. Fabric shown is Picture This Plus's 36ct legacy, trim is Lady Dot's Lush Lawn Chenille that has been coffee-stained and baked! 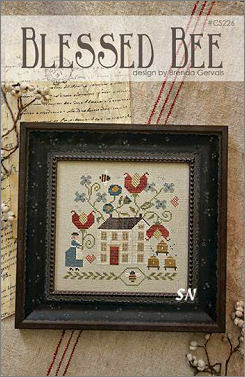 Brenda Gervais is sending 4 new charts later this week... always such a fun package to open when the mailman delivers!!! Here's the Scoop! 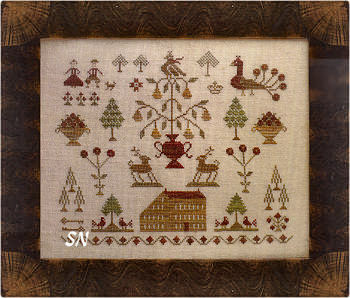 Merry Christmas -- Santa and his reindeer out for a stroll in the wintry landscape... this is shown stitched over one thread on the same 28ct Mushroom Lugana you might have enjoyed while stitching WTN's Summer Schoolhouse Series! (If you didn't enjoy going over one thread (! ), just go over two!! 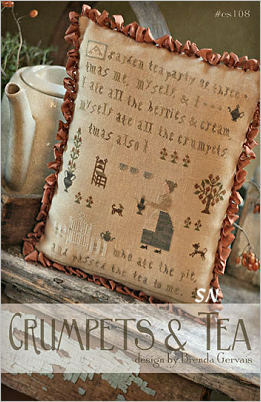 The Cross Stitch Fairies will not be upset with you!) A pretty design, this will finish either a petite 5-1/2 x just 2, or approx 11 x 4. Brenda's lovely color palette of Woodrose, Wood Trail, Endive, Chili Pepper, Eggshell, Peanut Brittle and Straw Hat hand-dyeds are featured. 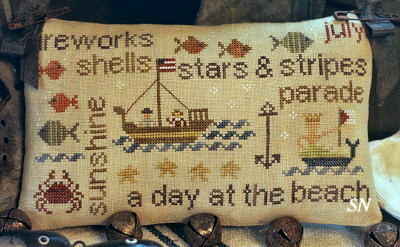 She even suggests you stitch this on large -- like 18ct linen over 2 -- you'd get a 17 x 7 sofa pillow! 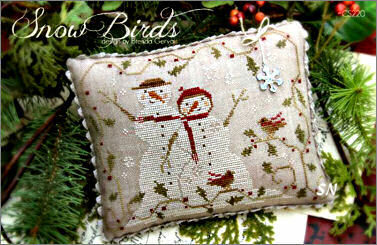 Snow Birds -- A snow-person couple chilling in the blustery winter weather! Brenda loves the assorted little winter birds that gather along the side of the roads but then fly away the minute you drive by. You can never get a good look at them... but she's always called them *Snow Birds* and in this design... had given them SCARVES to keep warm! 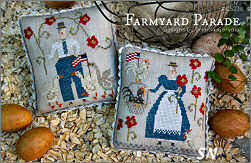 Weeks Confederate Gray linen provides the dreary, chilly background for this charming design! 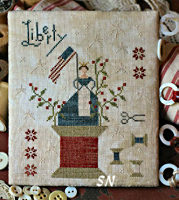 Stitch count is 121 x 85... Confederate Gray comes in 30, 32, 35, 36 and 40ct... so you have size options! Metal snowflake embellishment is a mystery and not included... sorrryyyy. O Tannenbaum -- This is cute! 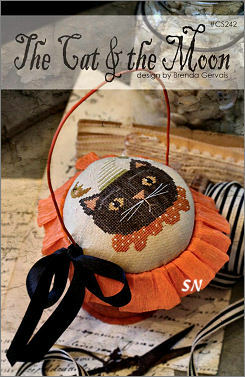 Make a set of 5 individual pin cushions, or ornaments... or put them into the fun little tray! Presented as the chart. (You're on your own for the sheep figure.) 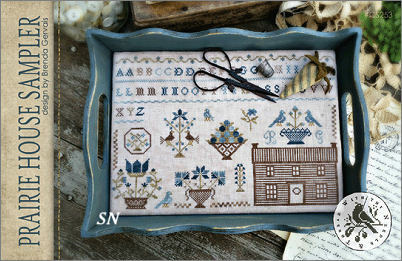 Stitched on 36ct Legacy linen by Picture This Plus, (pin cushions and ornaments can be worked on other counts, but 36 is absolute for the tray) the hand-dyed colors are yummy! Sandcastle, Red Rocks, Dried Thyme, Apricot Blush, Old Red Paint, Cidermill Brown, Woodrose, Roasted Marshmallow, Wood Trail, Eggshell, Hickory Sticks, Weeping Willow and Hazelnut. The wooden tray measures 10 x 10 x 1-1/2 inches in size. 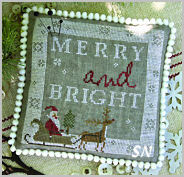 Jingle All The Way -- Another cute paper mache' box finishing treatment -- just like Spirits and Spells -- this is stitched on 40ct Confederate Gray with Brenda's gorgeous color palette of sift hand-dyeds. Bigger fabric count? Just get a bigger box! Trim pictured is Lady Dot Creates -- Mini Balls in Vintage color. Three new charts are coming our way in the next few days -- With Thy Needle is turning towards Fall and Halloween! Spirits & Spells -- A small 56 x 80 design, this finishes about 3 x 5 on 40ct (over two), and is shown mounted on top of a little paper box. Full of pretty hand-dyed Autumn colors, it is trimmed with Lady Dot's Vintage Mini Pom Poms -- which will work on the box or a pin cushion finishing treatment. 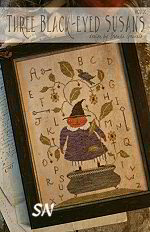 The little owl is darling... if you like the fall flavor but not the witch, leave her off and add your initials instead! 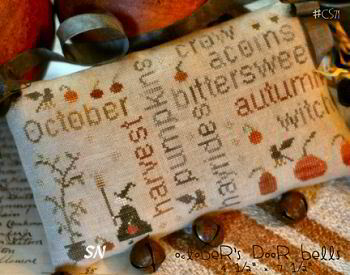 Autumn's Bouquet -- This is SO cute! 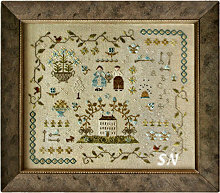 126 x 81 -- This finishes approx 5 x 7 on 36ct Picture This Plus Legacy Linen. 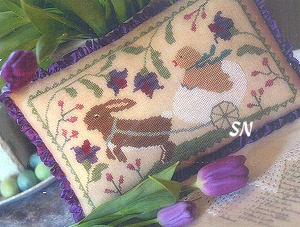 A mixture of hand-dyed cottons, the little squirrel is stitched with Rainbow Gallery's Antique White Wisper. If you don't get ANY of the other threads -- get that Wisper -- it makes him furry! The red tray looks like 'tin' to me, and acorns everywhere make it seem like he's in an Autumn Acorn storm beneath oak trees!!! 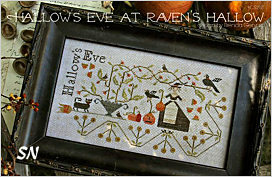 Hallows Eve at Raven's Hallow -- This finishes approx 6 x 10 on 36ct Beige Linen by Weeks Dye Works. 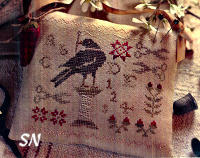 More pretty Autumny cotton hand-dyed flosses, it features a very spindly vine that is attractive to blackbirds. 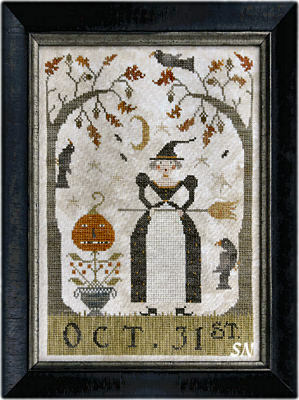 The witch on here doesn't look too mean... her broom is home to her cat and that glorious vine coming from the little black urn. 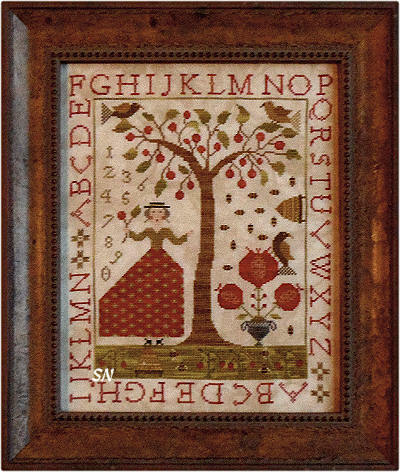 This is a 4-chart set that makes an entire collection of 4 x 4-ish alphabet pin cushions, a tiny 2-inch strawberry and coordinating little 3 x 4 (Miss Polly's Hornbook) wooden paddle! Part one features ABCDEFG, two is HIJKLMNOP, three is QRSTUV., part four finishes with WXYZ. Charming little houses, a courting couple, pretty birds and floral urns... everything in this design set is sweet! Stitched on 28ct Mushroom Lugana, the 9 x 54 cut called for will be enough fabric to stitch every piece in the set -- layout instructions are provided for you. Everything is stitched with Weeks Dye Works hand-dyed flosses. Lady Dot's Birdsnest Baby Rik Rak trim is featured -- available in 3-yard packages. The cute little paddle -- Miss Polly's Hornbook -- (instructions are provided for painting) comes with Brenda's cotton twill tape trim. 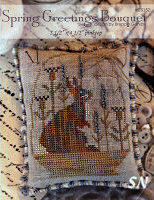 Stitch dots for each chart are available on a limited basis... we may have to special order them for you. 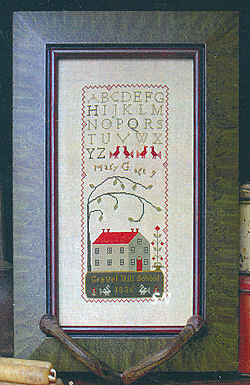 Each chart has one that features part of its alphabet lettering. $12 each. Weeks Dye Works hand-dyed green wool is featured as the strawberry topper. Our approx 8 x 8 schnigglet cut will do several berries. NOTE! 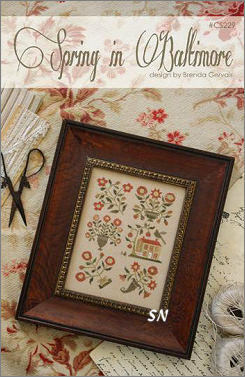 Brenda has sent us a layout chart that will be really helpful for you to portion out your fabric for the designs. Click here a pdf of it. 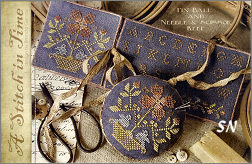 All the New From With Thy Needle! 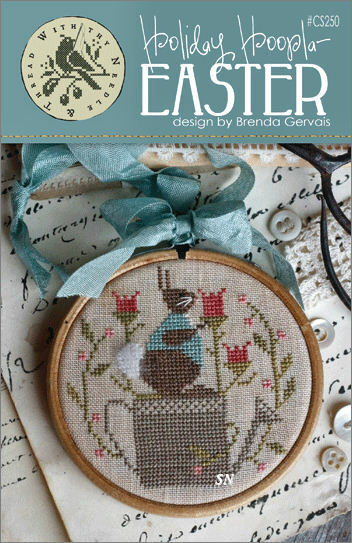 We have 11 new designs by Brenda Gervais... Easter, Summer and Stitching themes... everything is beautifully presented in her charts. 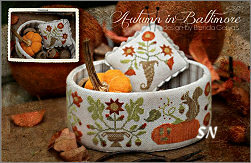 Scroll down to see all of Brenda's cute new things! 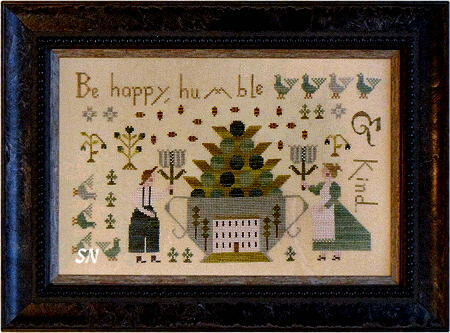 Quaker Handework -- Here's a pretty Quaker-inspired sampler -- not huge like so many you see -- this one finishes approx 10 x 6 on 35ct. Usually these are worked with one shade of floss -- this one features 5 colors! Very balanced, very pretty, the bird in the center makes a nice focal point. 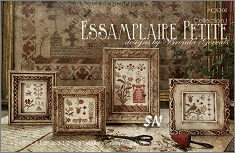 Essamplaire Petite Collection I & II -- Here are two different sets of 4 tiny samplers each. Models are on 40ct, and they finish about 2 inches each. You can work them on anything... they are small to begin with, so nothing will make them huge and gangly. 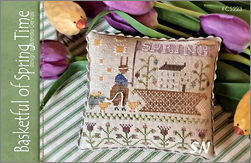 Just sweet pieces that are fun for a medley of tiny framed samplers to all gather together on a wall... or a set of pin cushions in a basket... you decide. Heart & Hand -- *Hands to Work, Heart to God* a simple sampler with a wide border on three sides and bottom alphabet. Very organized and 'new' looking. this finishes approx 10 x 10 on 18/36ct. cheerful colors, nice design lines, this actually would make a very pretty couch cushion!!! Faith of the Heart -- *God finds a low branch for the bird that cannot fly. * A gorgeous set of birds on floral urns -- that stately house in the center... and the neat verse... this is lovely. Finishing approx 11 x 6 on 36/18 ct, this has a lot of visual impact and good balance. Very pleasing to the eye! Lady Liberty -- A pretty floral urn and that billowing flag... very pretty design elements in this. Lady Liberty's skirt is kind of pale against the fabric... it was in real person as well. Change it if it clashes with your fabric choice. Finishing approx 5 x 6-1/2... very pretty. Easter Peeps Parade -- Worked on Week's Chestnut hand-dyed linen with hand-dyed flosses... check out the dark red rayon ribbon trim on this! What a *pop* of color! 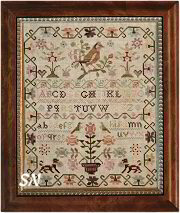 Finishes approx 7 x 3-1/2 on 36ct... we have Chestnut in larger counts... that dark fabric is hard to see in the smaller counts... and the Cross Stitch Police will not come knock on your door if you choose a larger count! Tulip Festival -- This one has a lot of visual impact -- you see the repeating tulip motifs on here... they mimic the dress! (thank goodness our hips are not shaped like hers!) Approx 4-1/2 x 7 on 36ct... just a cute springtime piece! Mice in the Sewing Room -- Oh My Gosh... MORE of these cute little mice! 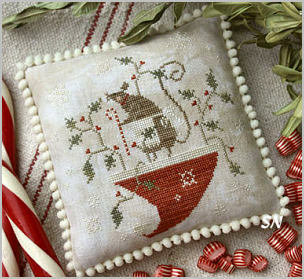 We have them at Christmastime... they can't get any cuter than these! Chart... finishes 4 x 4 on 35ct (you choose anything you want), hand-dyed flosses... tehy speak for themselves!!! 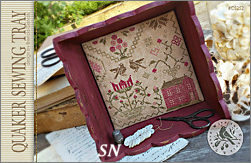 Berry Days at Thistle Down Farm -- A charming house design, this is shown on top of a wooden 'book' box, (6 x 5-1/2 x 2) and finishes approx 4 x 4. There is also a matching miniature fob design in the chart ... can you see it in our model pics? A pretty design all by itself, Brenda has finished this atop a wooden box (it is unfinished.. you do the painting) that looks like a book. It has 'pull out pages' -- a little drawer coming out of the side that is so cool! 36ct Linen, Weeks and Gentle Art hand-dyed cottons. 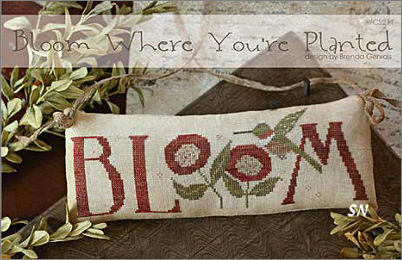 Bloom -- Another *word*... these designs are all fun! Very bold and simple, approx 9 x 3 on 35ct... it's all a brick red and mossy green colorway. With Thy Needle has 5 new designs! 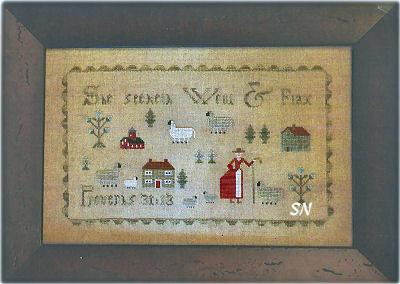 Wool & Flax -- *She seeketh wool and flax and willingly worketh with her hands. * This 5 x 7-inch piece is worked on 36ct over two with hand-dyed flosses. Our woolgatherer is in her garden with her sheep, shears are handy, but her sheep don't look too fat and furry! But the blue flowers are pretty, and the design elements are charming! Oktober Feast -- This is a cutie! 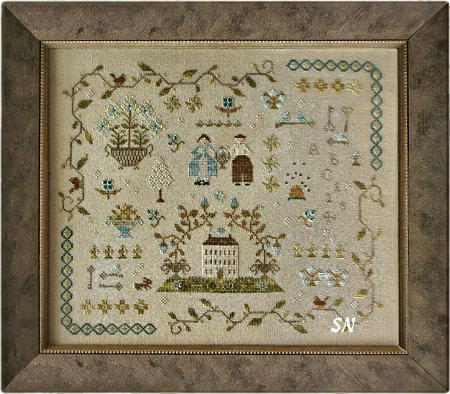 Just a 55 x 55 stitch count piece, it finishes about 3 inches round. 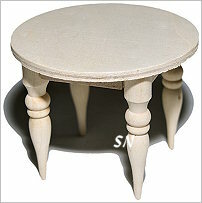 Worked with hand-dyeds on 36ct, it'll fit the most CHARMING miniature "wooden table' cushion base! Little 1-1/2 inch legs, give it a spray of paint, distress with some shoe polish or wax, add your stitching and trim with Lady Dot's Vintage mini-ball fringe. 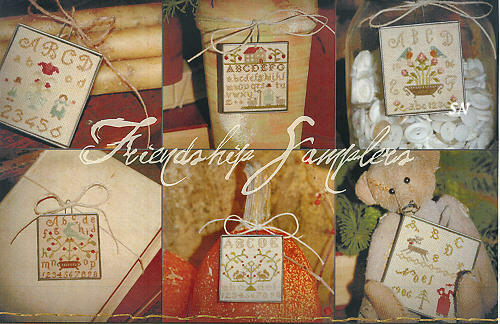 A trio of Holiday designs -- each are presented in chart format, and of course, worked with hand-dyed flosses. Christmas Tea -- This one companions last year's #170 Merry Mouse! She was hanging candy canes last year (still has her apron on and everything) and this year, she's serving Santa hot tea! They're standing on a gigantic Christmas china tea cup, too! Finishes approx 3-1/2 x 6 (petite! 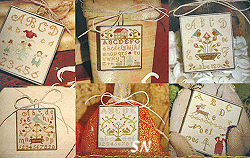 ), and Brenda has included a few images of the paper tea bag label, so you can make that little hanging tag. 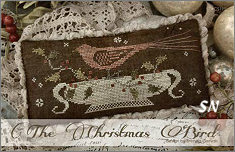 The Christmas Bird -- A lovely china dish set against a deep brown linen, this highlights Brenda's favorite ornament on her tree at home. It's one of the German glass birds with the brush tail. She always puts it on first, and takes it off the tree last -- so it remains of the top of the ornament box every year! The pic finishes approx 3 x 6 on Weeks Chestnut Linen. 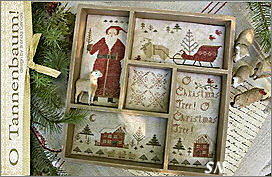 Snow for Christmas -- Santa on a sheep -- too early to be in his sleigh behind his reindeer -- he's bring in home a snowman and a few Christmas trees to decorate! 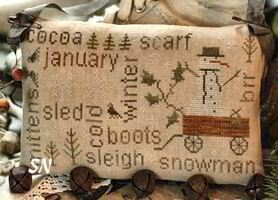 You can even stitch JUST that snowman sled as a single ornament in you want. He's making sure we have a White Christmas! Smallish at 3-1/2 x 7. 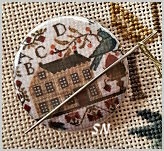 A charming floral urn 3-1/2 x 3-1/2 inch design has to be stitched on 36ct linen to fit Lone Elm Lane's super-cool NEW Sewing Clamp Bpx. 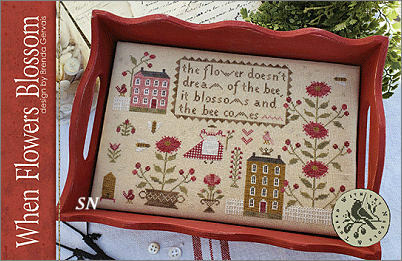 Brenda's design is stitched with hand-dyed flosses, and then is mounted into the top of that darling box! (This is offered in Vintage dove color only, at this point.) Offered as the chart, box is separate. 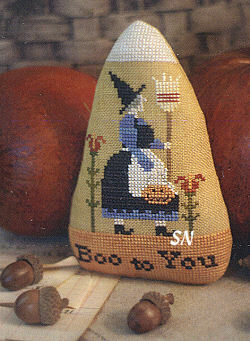 Just a big BOO, and a tiny witchy-mouse, this finishes approx 3 x 8-1/2 on 40ct! 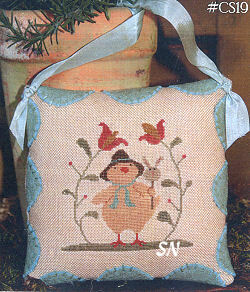 Hand-dyed flosses, chenille trim... JUST THAT LITTLE MOUSE is about 40 x 40, and cute enough to be stitched by herself! Offered as the chart. How pretty for a kitchen eating area or a dining room! 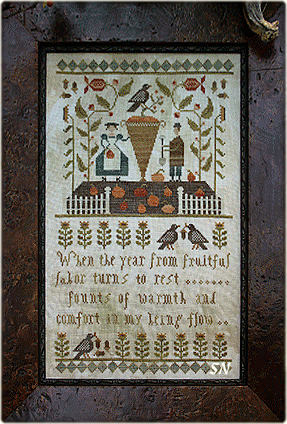 *When the year from bountiful labor turns to rest... founts of warmth and comfort in my being flow. * The farmer and his presumed wife (! ), their lush harvest and neighbors waiting for the big meal... this measures 137 x 227 -- or 7-1/2 x 12-1/2 on 36ct linen. Lots of delicious hand-dyed flosses, this is just a pretty piece!Offered as the chart. 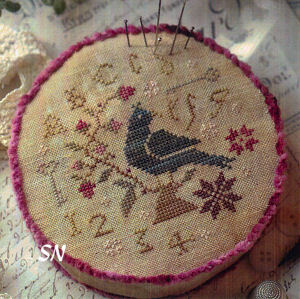 Finishing approx 5 x 5 on 36ct linen, this is mounted in a Lone Elm Lane Robin's Egg Blue Sewing Box. Several box colors will look good with this one! Simply Wools would be neat in the rabbits and their tails and even the chicks in the grass. I love everything about this! Cool irregular zig-zag sawtooth border, the repeating pattern in the tulips, and that awesome running rabbit complete with luscious basket of berries on her back, it's very pretty and festive for Spring. 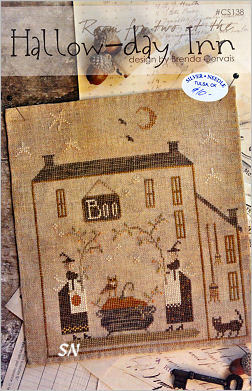 Finishes approx 6 x 3-1/2 -- very bitty on 36ct linen or 18ct aida. 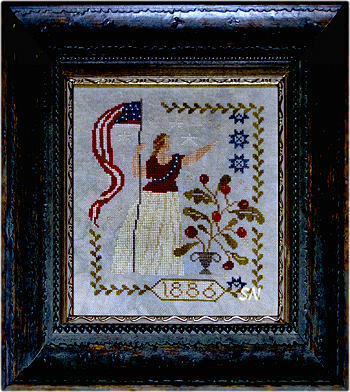 Brenda has been Inspired by antique coverlets woven by the Gilmour brothers of Union County, Indiana in 1839. This trademark house, between two trees with it's picket fence appears in most of their coverlet borders. Choose this cream on natural color way, or change it up to match your decor. It fits inside a small wooden tray measuring approx 4-1/4 x 7-3/4. The tray comes unfinished, so she includes painting and distressing instructions for you. You HAVE to stitch this on 40ct to get it to fit the tray... but on 7ct Klostern with #3 Pearl Cotton, it'd look like a coverlet and measure approx 20 x 9! Offered as the chart, we have the little trays for a limited time. 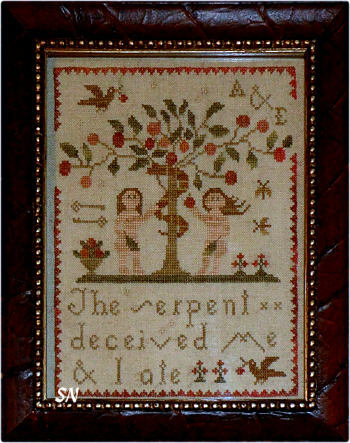 Inspiration for this came from a coverlet woven by Adolph in the late 1800's. 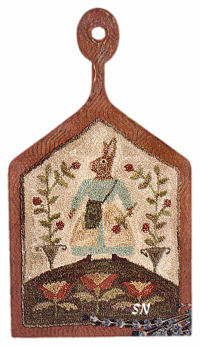 A male profession, the motifs used were their personal trademarks, and sometimes the customer's name was woven into the corner. A little history in this chart... Henry Adolph was a French weaver who settled in Iowa and wove until he died at age 92 in 1907. 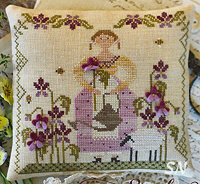 36ct Linen with one shade of thread, this finishes approx 6 x 7 -- isn't this lovely??? *Sew... A Needle Pulling Thread! * Isn't this a fun design??? Thank goodness we don't have to use our rumps to hold our threads like the girl in the piece!!! 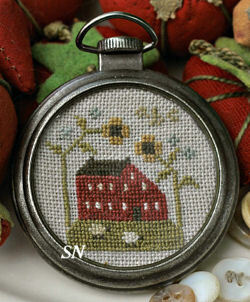 I love the buttons on the vines growing from the spools -- use some out of your Grandmother's button box. On 36ct, this finishes approx 11 x 6, and is worked with a smattering of hand-dyed flosses. Check out the little birds -- one has the threaded needle in his mouth, and then there is another going sideways up the tree stem. Cute scissor motifs scattered about, too. Very charming.... just a petite 3 x 7 on 40ct over two. Surprisingly, there are 10 different hand-dyed colors in here -- she has different red, creams and blues in Sam vs the flag... -- but I think you could get by using the same ones? Don't miss the puppy carrying his own little flag! 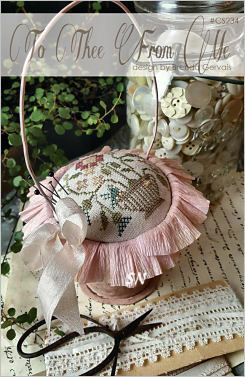 We have Vintage mini-ball fringe trim by Lady Dot Creates that will look awesome on this, as well. A little bitty thing, this finishes approx 6-1/2 x 3-1/2. 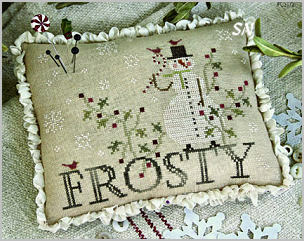 Garnish it with antique buttons... and definitely give it a little chenille trim around the edges. 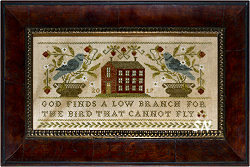 *Good Deeds Live Long* Fun little blackbirds in that border, this finishes approx 10 x 6 on 36ct. Neat pattern repeats in the tulips, but I just LOVE that border!!! Wow, wow! What a fun design -- patterned texture repeats all over the place! All the leaves -- basically the same shape angled every which way -- all the tiny berry dots mixed in to separate all the leaves. The milky bowl, the draped striping... the matching stripes in the flag... they take your eye from the left of the bowl right to the tip of the flag. Then there is the hat on the bird -- you almost miss that! I love everything going on in here! Fraktuur designs are traditional -- lots of them in Pennsylvania Dutch designs. This one finishes approx 14 x 8 over two on 36ct linen. Pretty rusts and greens. 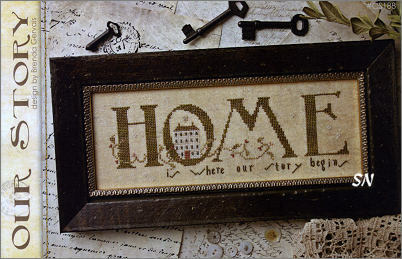 *Home is where our story begins. 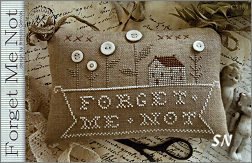 * What a neat piece to stitch for a housewarming or wedding gift!!!!! Presented in chart format by Brenda Gervais, this is pretty and not 'fussy.' Measuring approx 13-1/2 x 8-1/2 on 35ct, choose any neutral background material -- you just want that neat house to show up -- unless you want to change that color as well! Simple and fresh looking -- you CAN get it finished in time for the big event! You could even personalize this for your family or another. 15 Different shades of hand-dyeds in here, it SAYS Live Simply, but it's chock full of busy-ness!!!! Charming! Oh a sweet little case with matching pin ball... the colors and finishing on this are really neat. Stitched on Gunmetal linen with Dolphin, Cognac, Woodrose, Mustard Seed, Heirloom Gold and Ye Olde Gold, this uses some of Brenda's new linen twill tape along the edging of the pin ball. GREAT pic inside the pattern of the ball edges and inside of the case, this is such an unusual set of pieces!!! 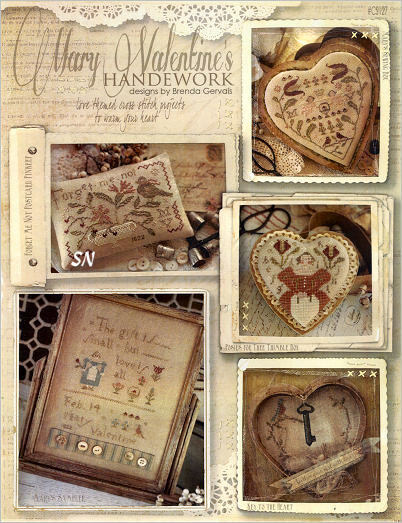 This love-themed chart by Brenda Gervais of With Thy Needle has now arrived. 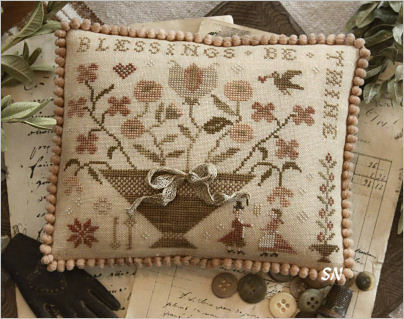 Stitched on 35ct hand-dyed linen it finishes approx a generous 5 x 6 and calls for Beige, Peach, Woodrose, Wood Trail, Heirloom Gold, Eggshell, Peanut Brittle, Polliwog, and Hazelnut. I love that soft ball fringe trim on there as well... we have a lot of colors available to blend with the threads and fabrics. Brenda is promising 12 new patterns at our wholesale Spring Market the first week of March... so hunker down and keep watching for all the Market Sneak Peeks that will be coming our way in the next few weeks! We've been waiting for this little piece to arrive since Christmas -- a little late for this year's NOEL Season -- but here in plenty of time for next year!!! 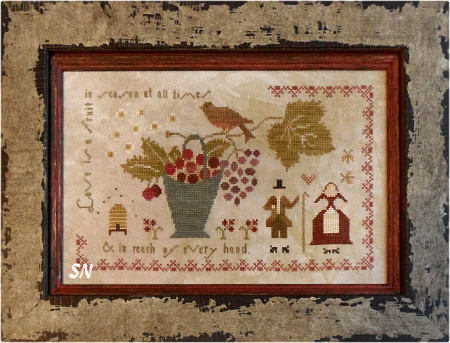 With Thy Needle's Brenda Gervais has stitched this softly colored design on hand-dyed linen in colors of Mulberry, Woodrose, Toffee, Muddy Puddle, Barn Door, Avocado, Tennessee Red Clay and Ye Old Gold. I don't see much gold in here... the urn I guess... but I see lovely antiqued brick reds instead. 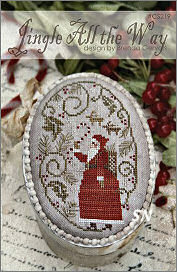 Offered as a chart, Merry Noel finishes approx 3 x 9 on 40ct and is trimmed with hand-dyed mini-ball fringe. Brenda has distressed her linen and finished stitching... you have lots of fabric and color options with this piece - very simple and elegant! Offered as the chart. 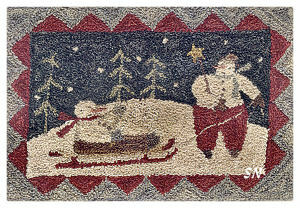 A giant St Nick and his reindeer pulling a little snowman sled -- all through a very sleepy village... this finishes approx 5 x 11 on 32ct. Definitely coffee-distress this for an aged look. Christmas From With Thy Needle's Brenda Gervais! Oh... we have four lovely new patters, so dog-gone cute... I don't really have a favorite! All are offered in chart format, so here we go! Ho Ho Ho! CS169 -- Merry and Bright... this one is stitched on a cut of Week's Dye Works 36ct Tin Roof Linen (it comes in 30 and 32 as well) with hand-dyed flosses. It measures a mere 90 x 90 stitches -- so 6 x 6 on 32ct... a generous pin cushion size. We have the most DELICIOUS chenille and mini-ball fringe trims by Lady Dot Creates... I hope you'll let us choose something pretty to trim this for you! One Starry Christmas Eve CS 171 -- Oh THIS is COOL! 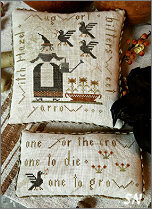 It is stitched on Aztec Red Weeks Linen -- so you stitch all that black -- NOT the red! (Think about using some wool to make the outside black area -- save yourself lots of extra stitches with that little trick! 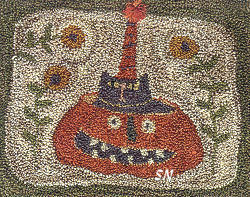 Terrifically yummy, this is just 108 x 111 in stitch count. The Aztec Red comes in 30 and 36ct. 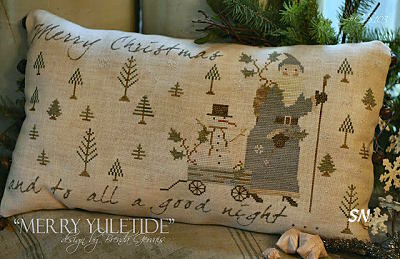 Jolly Happy Soul CS172 -- We love this little guy, choose a neutral linen -- something that his light color will show up on, and stitch this little 104 x 70 piece. The words are done in Classic Colorworks Muddy Puddle -- it's such a pretty and distressed flavor for this! Brenda Gervais has been busy... and has sent 4 new designs!!! Everything begs to be distressed with coffee or walnut shells when you've finished them, and even though they are shown framed... pillows and door hangings would be cool too. All 4 are presented in chart format. 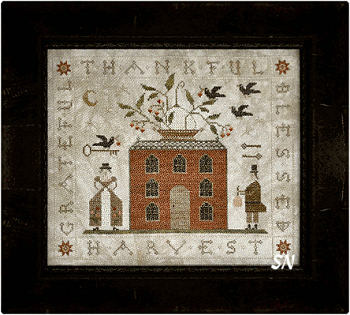 Grateful, Thankful & Blessed is a Thanksgiving piece -- The elegant house, Mr & Mrs, and the lavish basket of blessings up on the roof, this is worked on 36 count and finishes approx 8-1/2 x 10. 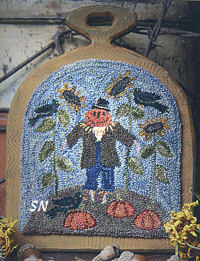 Oct 31st -- Kind of fun, check out the jack-o-lantern growing on the vine from the little pot! The blackbirds are clinging to the trees and the oak leaves and acorns on the branches provide lots of balance up in the sky. Stitched on 36, this will finish approx 6-1/2 x 9. 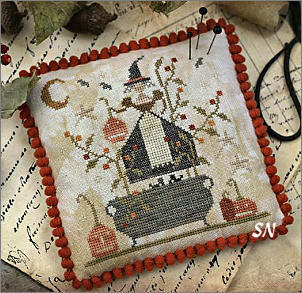 Witches Night Out -- A DARLING 5 x 5 Pinkeep, that little witch looks like she's NOT going to take a swim in the potion anytime soon, either! 36ct Linen, isn't the mini ball fringe yummy on here??? We have several colors that will work on here -- it comes in one-yard packages. Bobbing for Pumpkins -- Ladies doing the laundry, it looks like to me, but I guess they're planning a party? Stitched on 32ct Weeks Straw Linen, this finishes approx 5-1/2 x 7-1/2. This one could use some ball fringe as well... a little color around the edges. Brenda Gervais has two new charts that are really cute! 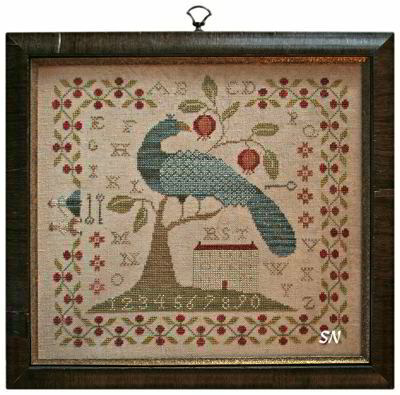 Bluebird Out My Window has a stitch count of 60 x 96, so on 30ct, it'll be approx 4 x 6, smaller or larger depending on your fabric choice. Soft hand-dyed colors, just a pretty little piece. 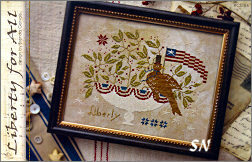 Grand Olde Flag is neat -- it has a STITCHER atop of nice big spool of thread! I suppose this could be Betsy, but I prefer to believe it could be me... battling for LIBERTY by conquering my huge stitching stash... and looking this good when I am finished!!!! (notice the crown on my head???) The model is stitched on 40ct hand-dyed linen with a mixture of brands of hand-dyed flosses. It finishes approx 5 x 6... and is shown finished onto a flat board with mother-of-pearl thread rings attached to the right side. *The serpent deceived me & I ate* Oh well!!! 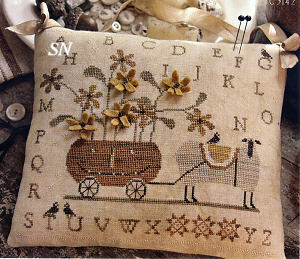 Something simple stitched on Weeks 32ct Beige Linen with several shades of hand-dyed flosses. Peach, Sage, Pelican Gray, Harvest Basket, Woodrose, Parchment, Apple Cider, Heirloom Gold, Weeping Willow, and Terra Cotta, this finishes approx 6-1/2 x 8. Oh gosh, this is pretty! Check out the neat, spindly stars and those gigantic pomegranites! Worked on 35ct linen, this will finish approx 8-1/2 inches square. Adobe, Schneckley, Sage, Caper, Pelican Gray, Harvest Basket, Woodrose, Roasted Marshmallow, Heirloom Gold, Endive, Blue Corn, Ye Old Gold and a bit of Terra Cotta! Offered as a chart. This is a fun piece! 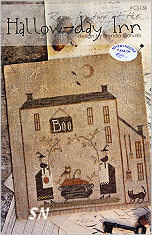 Stitched on 40ct linen, it'll finish approx 13-5/8 x 15-3/4, so it is quite large. Worked in lots (19) of various hand-dyeds, I love several of the design elements in here. I like the blocky border, and how it interrupts on the second go-around... and the fact that it doesn't start at the upper left corner. The cherries and leaves, bees and numbers all dot the background. I really like the beehive on its side!!! I LOVE the pattern in the dress. Then, Brenda tells you to stitch the flower stems down in the grass with the darker parts of your Avocado floss so you get lots of contrast. And... wouldn't the urn of pomagranites be cool done as a small pin cushion? 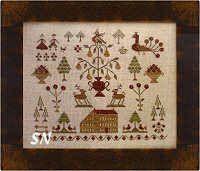 Stitched in 12 shades of Classic Colorworks Silks this finishes approx 12 x 5 on 36ct. Silks featured are Angel Blush, Attic Tea, Limestone, Mudpie, Oatmeal Scone, Poison Apple, Pumpkin Carriage, Red Fox, Scarecrow, Miss Green Jeans, Peaches n Cream and Slate -- with DMC floss options as well. Well this looks very Pennsylvania-Dutch to me! The giant urn with the house in it is interesting... there are 14 different colors in this! 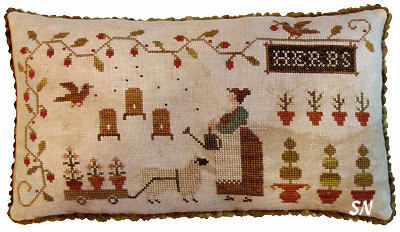 Stitched on 35ct linen, it finishes approx 10-1/2 x 6. Actually quite a different look than the rest of this new group of designs. *Love is a fruit in season at all times & in reach of every hand. * I LOVE LOVE that big urn of bounty! Verse is worked over one. On 36ct linen, this finishes approx 9-/2 x 5-1/2 and is worked with 20 different shades of hand-dyeds. It doesn't look like that to me... but that's OK! You can pull out that urn, leave off the things in the background, and delete the bird and grape leaf, and it'd make a neat harvest cushion! Offered as a chart. 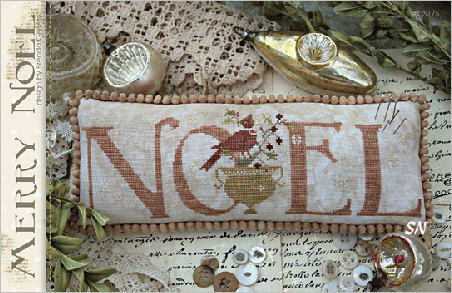 Brenda has finished this into a big 'ol pin cushion! On 40ct it measures about 8 x 4, and is worked with 18 different hand-dyed flosses by Weeks, Gentle Art and Classic. The chenille trim around the edges is a soft touch... but you could try that torn fabric edge treatment she has shown on her Spring Greeting Bouquet design. That's kind of fun because you can choose a fabric that matches your stitching -- even use a coordinating color from the same fabric line. Offered as a chart. 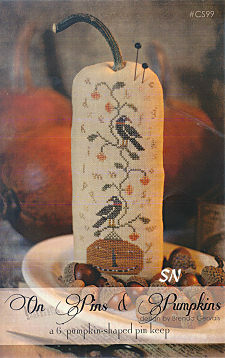 Offered as a small chart, this is worked on Weeks 35ct LINEN color of linen. 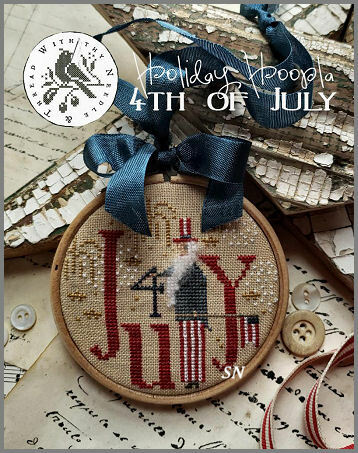 Using 10 different hand-dyed threads, basically, you are covering a backing piece with puffy and fabric, as well as the front. 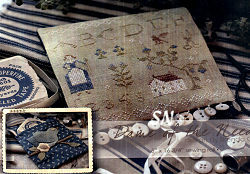 Attaching buttons, and whip-stitching the two pieces together to form a firm-sided envelope. If you've ever taken one of Magic By Mona's finishng classes -- you'll know how to do these steps in your sleep! Coffee-staining your buttons is an option on here as well! Very cute, this is a neat finishing idea. 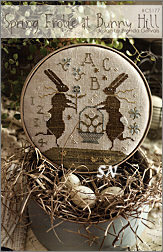 Your little bunny-in-the-basket is stitched on 32ct Weeks Beige Linen with Palomino, Woodrose, Mountain Mist, Endive, Otter Creek, Wheat Fields and Eggshell hand-dyed flosses. 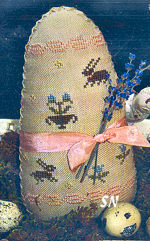 Butterfly is over one, French Knots for the lavender buds. See how pretty a few of our black matte Mourning Pins look poked in here? We have old Fashioned Pear-shaped Safety pins as well... Anyway, the edging is a torn strip of blue and white ticking that is TACKED on around the edges!!! Such a cool look! The bow on there is a super-duper beeswaxed piece of thread... we have some darling waxers by Noteworthy Needle now to use for this! What a charming little piece! 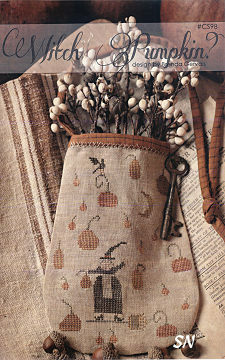 Stitched on 32ct Beige Week linen with yummy hand-dyeds, once again, you are making a puffy, covering the gathers along the bottom with fabric, attaching it to your painted and distressed candlestick base, and then sewing on dangly buttons for trim! Running your floss through a waxer several times gives it that aged, cotton cord feel, and makes a neat, stiffened bow to trim. Offered as a small chart. 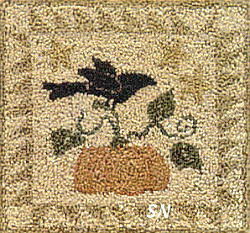 A sweet piece by With Thy Needle, this is a simple bird, stitched on Week's Dye Works Linen color of hand-dyed linen with Classic Colorworks silks of Eiffel Tower, Sagebrush and Peaches 'n Cream, this finishes approx 4 x 5. Garnish with some antique buttons, and then gently sew through silk ribbon or twill tape. Brenda gives good instructions for that finishing treatment. Everything on this is so softly shaded... I'm thinking you'll want to find your ribbon or tape FIRST, then work on the linen and finally choose some thread colors. Notice the dark pins stuck in here? We have matte finished black mourning pins, and pear-shaped old-fashioned safety pins -- both neat options to dress up your little cushion! This is a fun design -- a pair of cooks in the kitchen, I think they're starting a fresh pumpkin. The little owl looking on better move out fast, looks like he has to dodge the family cat waiting outside as well! 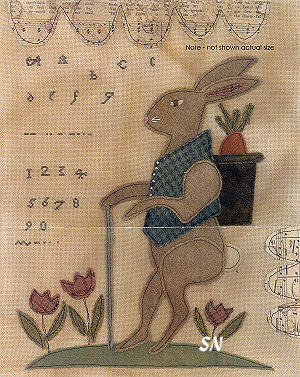 Brenda offers this as a chart -- it is stitched on CREAM linen that you coffee-stain before stitching. Easy instructions are included for that to make this 8 x 8-ish inch piece. Worked with all three brands of hand-dyed floss, it's just kind of a sparse little thing! 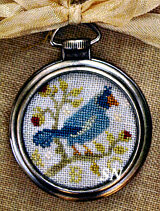 A sweet little bluebird worked with one ply of floss over one on 32ct Platinum linen... get out the magnifier! Using just bits of hand-dyed floss, this fits into one the new watch-face charm frames we have. Quick finishing, I'm not sure where you'd put this... maybe a basket tie or something small... but it is pretty! Look at that little kitty pulling the garden wagon of pumpkins! (she's only 20 x 55 stitches!) And check out the little owl watching over the garden! 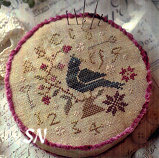 This is another pretty pin cushion design that measures approx 5 x 10 on 32ct. 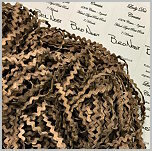 Mange up your fabric a little before stitching (Brenda tells you how in the instructions), stitch this, add some mangy fringe, and add this to that overflowing basket of yours that displays a million different walnut-shell-stuffed cushions in it. Good hand-dyed colors from all three floss companies! Offered as a chart. A wisp of a thing, this is worked over one thread on 32ct linen using overdyed flosses. It fits into the watch face pieces Brenda has used in some of her Halloween pieces. 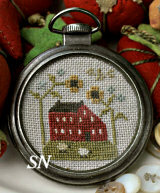 Stitch count is only 39 x 43... so even a small scissor fob would be cool. Offered as a small chart, watch finding available separately. 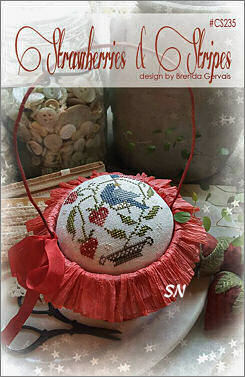 Country Stitches' Brenda Gervais has new Autumn and Christmas designs... you can see how cute they are... even without any descriptions from me! A very competent sheep pulling his pumpkin cart, some of his fall flowers are actually tiny bits of hand-dyed wool tacked on after the stitching is complete. 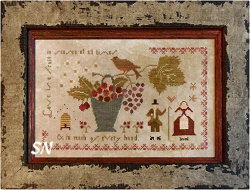 Finishing approx 6 x 7 over two on 40ct... it is worked in hand-dyed flosses that include Gold Leaf, Pumpkin Pie, Toffee, Endive, Caper and Schneckley. We'll send a pretty schnigglet cut of wool that matches the design -- if you need some. 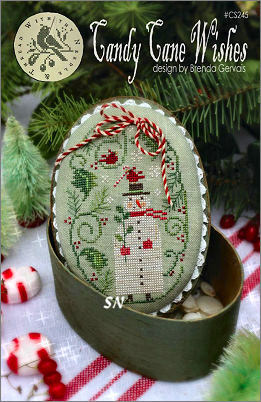 This makes a calico-lined, button-trimmed sewing case, complete with tiny wool strawberry cushion inside! 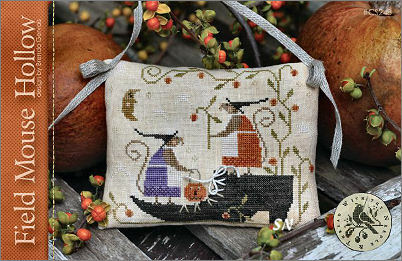 On 40ct, it measures 8 x 3-1/4 and is stitched with yummy autumnal shades of hand-dyed flosses. 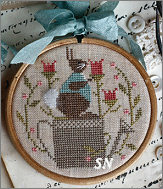 Since it is a symetric design -- you could stitch just one half -- but I love the repeat of the squirrels and the flowers. A Christmas Cupboard Pocket... can you see the houses running up and down the sides of the design? Stitched on 40ct over two, if you go larger you'll just need to adjust the shaped templates a bit. Santa is here surrounded by that charming little village! 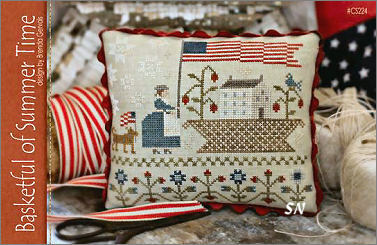 Stitched with overdyeds, Brenda includes all the finishing instructions -- I love that button touch on the needlework. The chart INCLUDES a small printed piece of antique music -- it's poking out of the pocket! 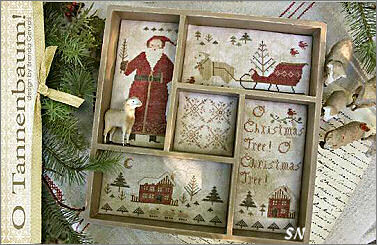 A cut-away scene of Christmas Eve... this is shown in a frame but it might make a really pretty soft pillow. Worked on 36ct Confederate Gray Weeks linen, it finishes only 8 x 9. See the little sheepie on the mantle? He is over one! The brick wall is a combo of Putty and Almost Auburn overdyeds -- lovely! 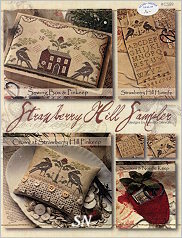 With Thy Needle & Thread's Brenda Gervais has released three new samplers -- Sampler Hill is just one of them. Worked on Weeks 30ct Cornsilk hand-dyed linen with 21 different shades of hand-dyed flosses, it'll finish approx10 x 13. A pretty overall balance to this, everyone likes the way the trees seem to cradle the house on the hill. 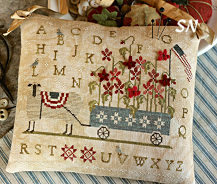 The alphabet in the grass is a favorite, and the fact that the beehive interrupts the border at the middle top adds charm. 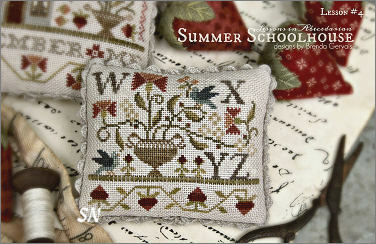 We love to distress these samplers AFTER we have stitched them. Dilute walnut crystals, or use some leftover coffee grounds to stain your fabric and threads to give them a more aged and relaxed look. Offered as a chart. 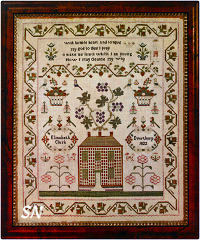 This would make a lovely wedding sampler, our house-established, family tree type of thing. 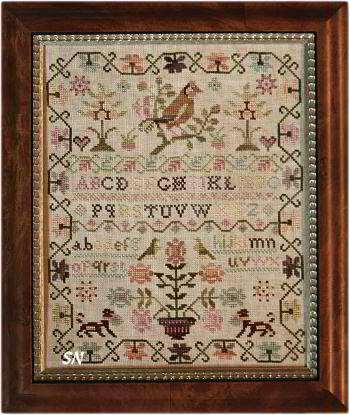 Add specific and meaningful dates and initials in some of the leafy border areas and in place of the medallions in the lower left and upper right corners -- inside of the teal blue borders. 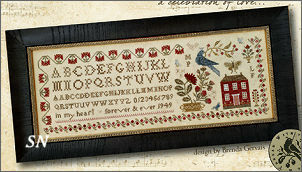 Very pretty... what an awesome sampler for a new family!!! Offered as the chart. 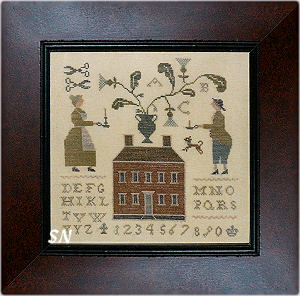 This is Brenda's reproduction of an antique sampler in her personal collection. Stitched by a 7-Year Old (!!!)... 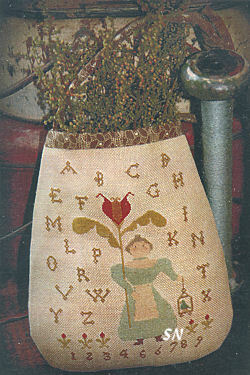 little Mary Jane had a few problems with her spacing and threads... but she did finish her piece. 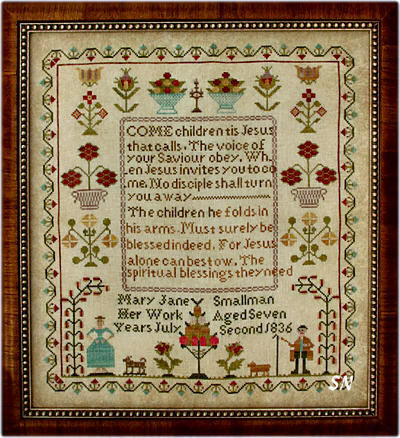 The verse came from a 1790's book -- Sermons to Children. Mary Jane ran out of thread so she had to change colors... and she ran out of space and let her words interrupt the confines on the sampler. 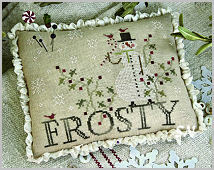 When you have finished stitching this... distress it with coffee or tea. It needs some staining to help give it it's original charm. 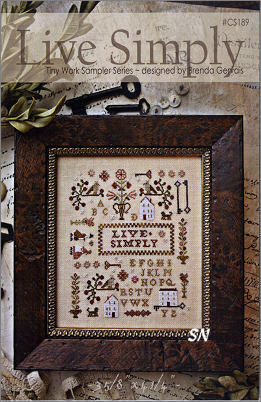 Stitch count comes in at 12 x 13 -- just a perfect size to actually finish in a reasonlble amount of time! 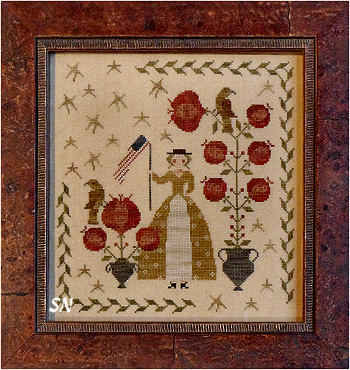 Such dusty and aged colors of denim, brick reds, mosses and taupe, this 6 x 7-1/2 inch piece is worked with Classic Colorworks, Weeks and Gentle Art hand-dyeds on 40ct distressed linen, over two. It'll be a bit larger on 30ct, but not much. The five wool flowers on there could be bits of flannel or even colored linen that you have... you'll just want a color that matches your flower flosses. Brenda has distressed this with coffee staining... and we offer crushed walnut crystals from Stacy Nash that do the trick nicely, as well. This would be precious in a little girl's room or a sunny guestroom. Worked with hand-dyeds on 40ct linen - don't mange this one up with as much coffee staining -- our Ms Violet needs to stay clean! 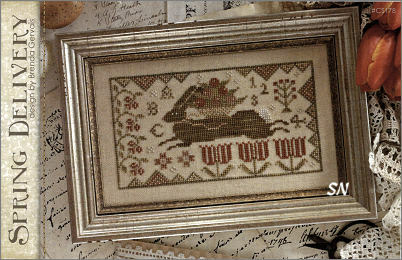 Again, you can see the small wool flowers that are sewn on here after the cross stitching is finished -- use wool, floral fabric or flannel -- whatever looks best with your flowers. Violet has a stitch count of 95 x 102, and is offered as a chart. Isn't this the sweetest little piece??? 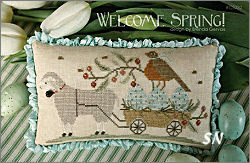 Your Springtime visitor is worked on 28ct Straw hand-dyed gingham linen with a few Weeks and Gentle Art hand-dyeds. He finishes a mere 4 x 5, and is garnished with a smattering of old buttons. We have small shell buttons (by Kelmscott -- a set of several dozen buttons runs $7) that work great for this... but you might have some old buttons in your collection somewhere that would be perfect. 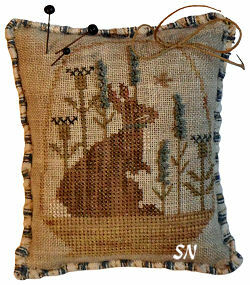 Make him into a hanging pillow or small cushion... the colors are very dusty and soft. Offered as a chart, buttons are separate. 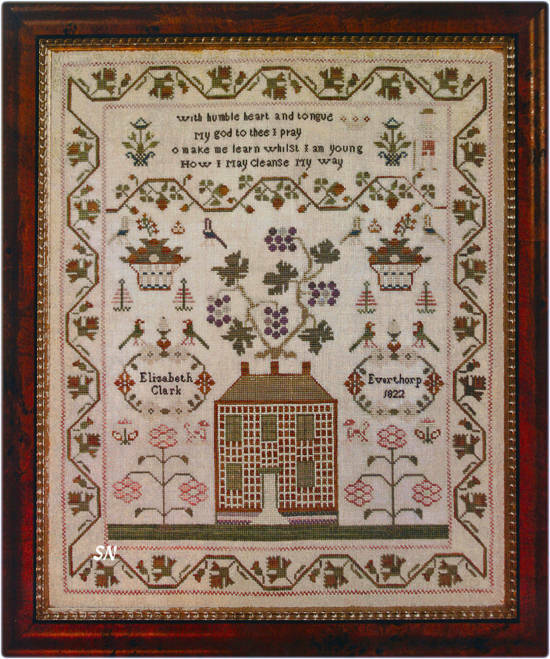 Brenda Gervais has the original antique sampler stitched by Elizabeth Clark in her personal sampler collection. 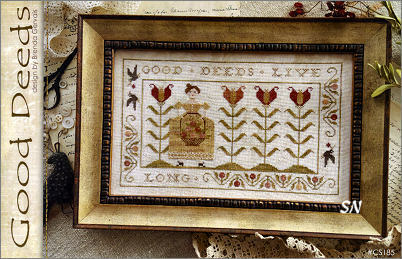 Enchanted by the grape vine billowing from that awesome house, all the poppies in the border, and even the little man up in the top corner, she has recharted this following most of the original colors of thread that still thrive on the back of the piece. Stitched on 32ct Antique Ivory Linen in Weeks and Gentle Art flosses, this finishes approx 20 x 22-1/2 in size. Such pretty balance ... the colors are (several multiple skeins are needed) Light Khaki, Beige, Straw, Peach, Pebble, Putty, Pecan (5 of those!) Basil, Kudzu, Teal Frost, Dried Thyme (5 of those! ), Woodrose, Baby Spinach, Caramel Corn and Wood Trail. Offered as a chart. With Thy Needle has several new releases... this is another one of my favorites. 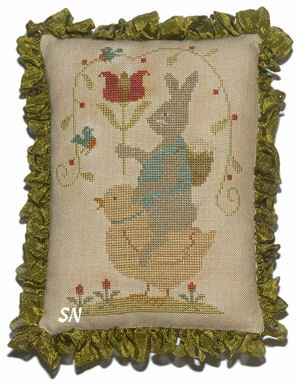 Mr Bunny riding his Chick friend, he finishes approx 4 x 5 on 40ct... but will be larger on larger counts of fabric! He's offered as a chart and has lots of Springtime personality! Worked in Weeks and Gentle Art overdyeds, Brenda includes instructions for gathering the silk ribbon to make her pretty edge treatment. 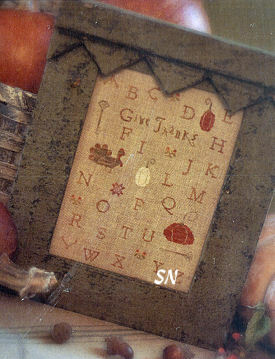 The instructions give actual sized templates for the pocket shape as well as the penny tongues that are cut from wool. 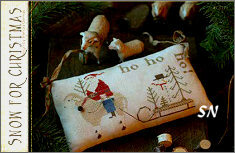 Its a neat finishing idea because it can perch on a table, shelf, or hang from a peg or doorknob. Offered as a chart. What a charming set of small romantic-themed designs! 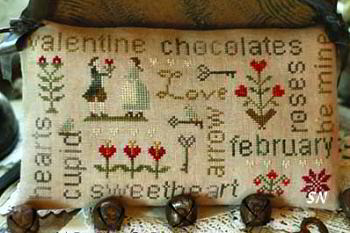 With Thy Needle urges you to go purchase small heart-shaped boxes of chocolates -- 1.6 oz Whitman's or 1.75 Russell Stover's, and the next larger size -- and use your empty boxes to finish 3 of these designs! 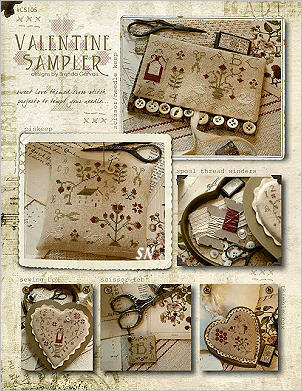 Little Valentine Samplers and pin cushions... all 5 designs in here are worked on R & R's 30ct Old Towne Blend Linen with a smattering of overdyed flosses. I can't choose my favorite design from this. 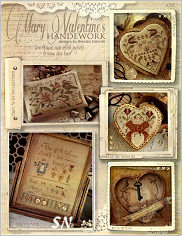 The Forget-Me-Not pin cushion is very pretty... but I think the heart boxes are so unique -- they take your finishing in a whole different direction. 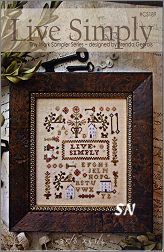 Everything in here is offered in chart format with all the finishing and distressing info included. You'll just NEED those *empty* chocolate boxes!!!!!! 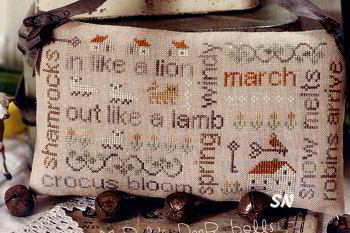 Well... every addicted Stitcher needs this sampler!!!! 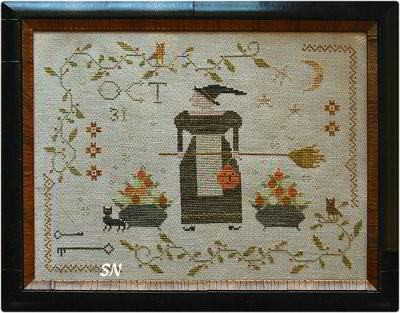 By Brenda Gervais, this measures 146 x 242 stitches -- so on 28ct, it'll be 10 x 17, and on 40ct it'll be 7-1/2 x 12. (You can choose any color and count you wish!) 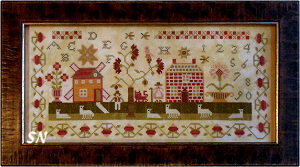 A pretty winding border that is not symetric, the house is neat, I love the little dogs in there, and of course, who isn't drawn to the charming scissors and her fun, trailing thread from her needle? Great Week's Dye Works hand-dyed colors including Parchment, Straw, Peach, Putty, Pecan, Palomino, Sage, Oscar, Olive and Red Rocks... there is opportunity to add more rust colors as well. Offered as a chart. 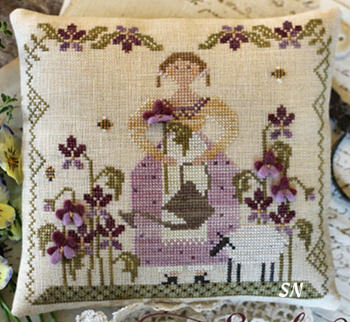 Oh, this is a pretty spot-motif sampler -- tiny subjects scattered there and here -- this is worked in only five shades of hand-dyed floss! Weeks Peach and Schneckley, along with Gentle Art's Mulberry, Apple Cider and Endive. 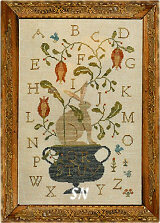 The stitch count is 157 x 130, and it is just a fun piece because there is no verse or alphabet, OR border! Of course, you can get creative and add all that if you want, or just keep it simple. 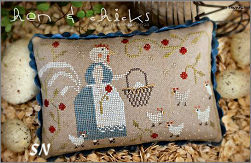 I think this would make a really pretty couch pillow, especially if you finished it with some soft flannels or wools. Offered as a chart. Stitched on 35ct hand-dyed Linen in shades of Weeks and Gentle Art, this does call for some Valdani threads that you might need to sub from your stash. 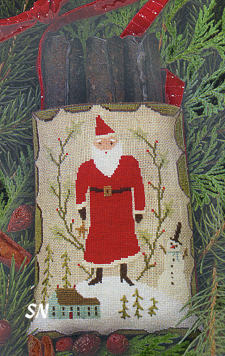 The stitch count is 207 x 155 -- so 35 count finishes approx 9 x 12. Choose any fabric count you want... and coffee dye it yourself if you haven't a piece of hand-dyed laying around! (you CAN do that!) Anyway, just a charming piece -- not Christmassy, just Winterry! Wow, this is a pretty piece in person. You'd think that peacock is awfully big, but the colors are Otter Creek and Mountain Mist and just so pretty. 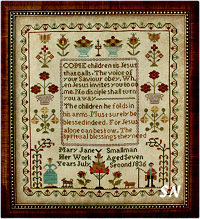 Stitched on 30 or 35ct hand-dyed linen, this has a stitch count of 176 x 150. I like the couple tucked in the border, and the manor that is very subtle on the hill... something about this is very appealing to the eye! As with a lot of Brenda's designs... you can start with hand-dyed fabric... or you can distress the finished piece all at one time when you are finished if you like that look. Offered as a chart. I shall not go to town while the wild bittersweet blooms... but I think she's already dressed and waiting to go! Check out her awesome pants!!! 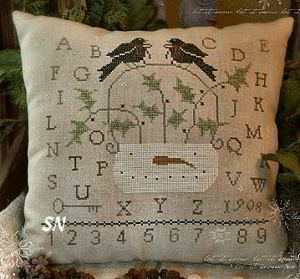 What a fun piece to stitch up quickly and make into a pillow -- I think ticking fabric or dark flannel would look really good with this. The stitch count is 126 x 191 -- she's worked on 30 or 35ct hand-dyed with Weeks and Gentle Art hand-dyeds. I'm thinking you'll need 2 skeins of Pelican Grey for her pot, probably 2 of Olive for the grass underneath, and 2 of Week's Plum for her outfit! (Her pants are Parchment and graphite.) Kind of fun, offered as a chart! 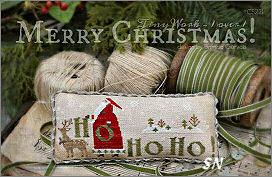 Something very traditional for Christmas with lots of coverlet-inspired motifs, this has a stitch count of 218 x 226, so choose your fabric count based on the finished size you want this to be. Stitched with plain 'ol DMC floss, you can always distress later if you want... but this is pretty, clean and nice just the way it is. If you're an over-achiever, you can do some special stitches in the #3866 borders dividing the alphabet, or do Satins in all the stars, and you could even stitch the reindeer with Gentle Art's Simply Wool! Offered as a chart -- enjoy! Stitched on 30ct Week's Parchment Linen with 13 shades of Weeks and Gentle Art hand-dyeds, the chart is a pretty easy-stitch! Finished stitch count is 137 x 169. 188 x 135 Stitches of Halloween Magic! Our plump witch looks to be preparing for her Scary Evening!!! The border is kind of neat - very irregular. The little owls are precious... the skinny cat looks scared, and the broom looks worn and wispy. Worked on a mangy hand-dyed... always use the overdyeds called for to maintain the old and antique-y look. Offered as a chart... for some reason, I can picture this finished as a neat pillow with lots of fringes. 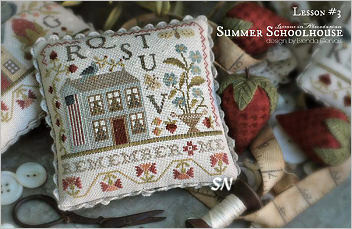 With Thy Needle's Brenda Gervais is bringing us a new 4-Seasons Set of samplers -- Autumn is the first! 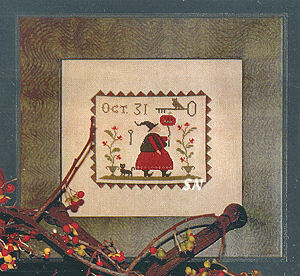 Releasing on the first day of the preceeding season -- (this means that the Winter Season Sampler will release the first day of Autumn 2011!) 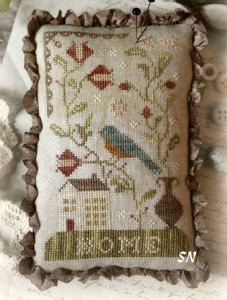 Stitched on 30ct hand-dyed linen in 28 different shades of Gentle Art Sampler Threads, this measures almost 13 x 13. 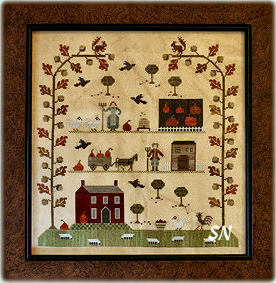 Check out the neat oak tree border -- acorns and leaves. All the bands feature pastoral scenes of the Autumn season... but I love those two squirrels guarding the top of the piece! Offered as a chart... we're auto-shipping the other three seasons -- as we know the release dates, and it's easier for us to remember that, than it needs to be for you! Winter definitely follows the same design format as Autumn -- big surrounding greenery that acts as the border, and four rows of daily life scenes of the season. Snowflake motifs buried in the banks, they are again, scattered in the sky. A generous 190 x 197 stitches, choose a yummy hand-dyed linen and the Sampler Threads from your stash! Spring:The same wild vine border surrounding the sides, it looks like they've painted the house for the new season! All the yard activity is apparent as well. Stitched on Week's 30ct Parchment Linen in lots of hand-dyed flosses, this finishes the identical 13 x 13 of Winter and Autumn. 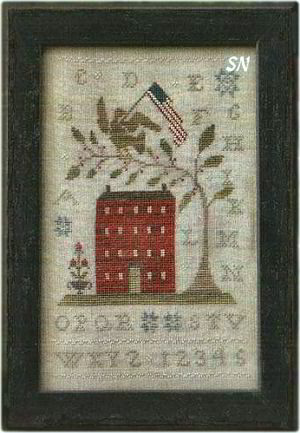 A 5 x 7 mini-sampler, just a neat house underneath an ever neater tree, complete with eagle and flag... and of course, the alphabet. 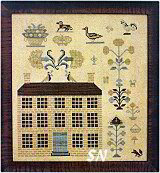 No special stitches or anything, you could always add some in the lettering or the tiny borders and ding-bats, or even the grass or bricks on the house. But if not, this is simply a charming, primitive piece full of rich Pomegranate red and Endive green. Offered as a chart. 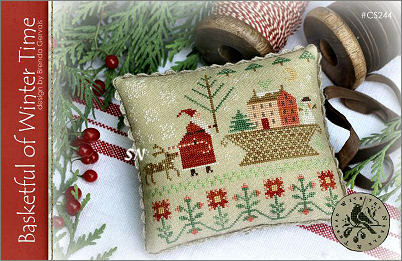 How cute is this little pillow? 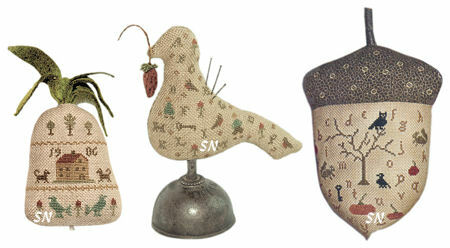 Not your traditional Sewing Bird at all!!! A small 4 x 5-ish piece stitched with overdyed flosses can you see the flannel strawberry in the upper left-hand cornner? The pattern for that little guy is included with this chart! 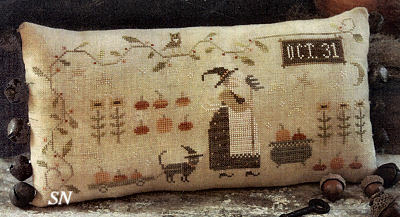 It is attached to the finished cushion. A sweet design -- offered as a chart. What a fun shape Brenda has chosen for this finishing treatment! A 1 x 4 inch stuffed (ice-cream sandwich, hockey puck, or -- her buttermilk biscuits!) pin cushion, this is a little more structured than all her other floppy walnut shell filled squares. 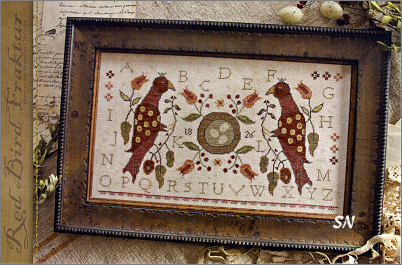 A charming little bird tucked amidst a few alphabet letters and a berry vine... the stitching on this is minimal... only 64 x 64. BUT... even though it is small in size, it is charming! Offered as the chart with complete finishing instructions. Oh Gosh... this is SO CUTE!!!! I didn't realize it till I opened my package to help me describe it to you better. The stitching on the front of your 5 x 5-ish roll (really not rolled -- kind of a flat tri-folded case) is the alphabet, house and girl. Inside your roll/case you'll make a sweet felt or wool bluebird applique design, with a coordinating little ticking pin cushion! Brenda has a couple of really good photographs in here to show you the finished piece, and lots of instructions, along with all the wool piece templates. NOT your average Cross-Sttiched Sewing Roll! Offered as the chart with all the necessary instructions! 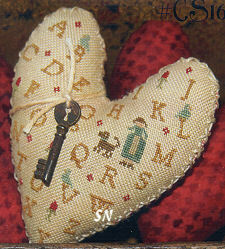 The PERFECT little cushion to store and display some antique keys! 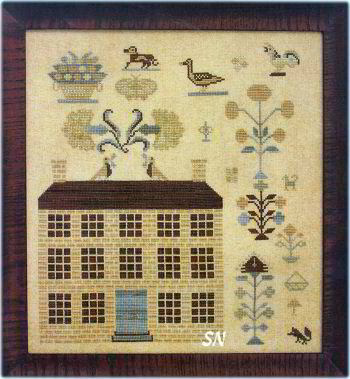 Your family mansion stitched on 35ct Weeks Straw linen will finish 5 x 5-ish. It'd be kind of fun to replace the alphabet letters with house numbers of possibly Grandma's house and some of her old keys??? Offered as a chart. Three Tulips is one of my favorites. With a stitch count of 132 x 200 it'll finish approx 6-1/2 x 10 on the called-for 40ct Weeks Parchment linen. It could be quite large on 18ct cream -- it would be 15 x 22 and make a huge guest bedroom pillow with some neat ticking and antique lace! It's a pretty piece stitched with 10 different overdyed flosses, you could even stitch your bunny in Simply Wools from Gentle Art -- and he'd be a little furry! Check out the rest of the releases which are all chart packs. There is a basket that is finished onto a pillow -- real neat. I love this verse: *A garden party of three, twas me, myself and I...I ate all the berries and cream, myself ate all the crumpets, twas also I who ate all the pie, and passed the tea to me! * So charming... can't you just picture a little girl playing by herself in the garden... having a tea party with her dolls and bears? She had a great meal!!! 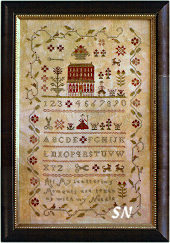 Offered in a chart pack, this can be stitched on anything you like -- the sample is on 40ct Parchment and measures 8 x 9. 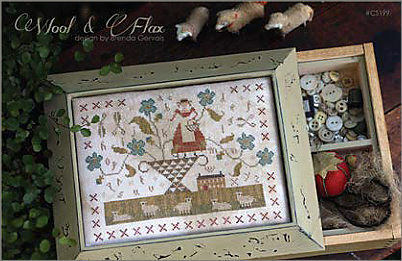 Once again, we love stitching some of Brenda's things on large linen...(this one could be up to 18 x 20!) Mona finishes them with darker fabric underneath the linen... it kind of creates a pretty shadow of color... then trims with old lace and pretty mother-of-pearl buttons. (load up that guest bedroom bed with a mountain of gorgeous hand-stitched pillows!) This pillow in the pic features rouched twill seam tape -- another really cool edge treatment! 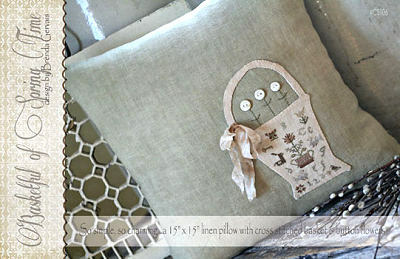 What a pretty little design tucked so cleverly onto a linen pillow! 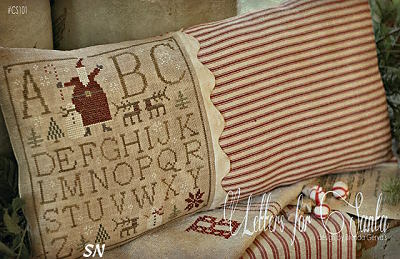 (Pottery Barn has really pretty ready-made linen pillows...) This is actually just a tiny design stitched on 40ct Weeks Parchment linen in 6 shades of hand-dyeds. On that fine fabric, it measures approx 3 x 4. After stitching is complete you IRON it onto freezer paper, cut out the basket shape (this might be scary for us non-finishers! ), and then applique (little tack stitches) onto the larger linen pillow fabric. Then... add the buttons and ribbons, and construct the pillow, complete instructions are included. 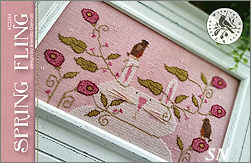 A really pretty finishing treatment... something different for that pile of luscious pillows you are making!!! Anyway, this is offered as a chart. 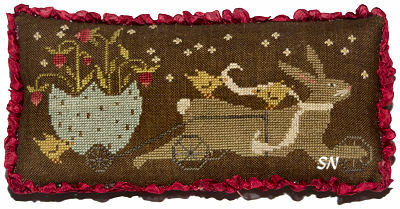 It is worked with 13 different shades of Weeks and Gentle Art flosses on 40ct Weeks Parchment Linen. Several other linen options would be pretty for this as well, and if you have to change that house color to a steely blue or lovely distressed colonial green... that's OK too! 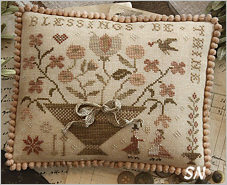 Very pretty and restful... stitch count is 148 x 134. All is stitched with Weeks and Gentle Art Sampler Threads overdyeds... and Brenda is terrific at providing all the finishing specifics about distressing the linen, filling the cushions, painting those boxes... you're just on your own to buy the chocolate and figure out something to do with it before you need the empty box for finishing! Offered as a chart. Brenda Gervais of With Thy Needle has reproduced an antique sampler that is big on traditional motifs and easy on the stitching! Originally worked by 13yr old schoolgirl Frances Pool in 1832, the antique has colors on the back that are still bright, but the front has aged quite a bit. 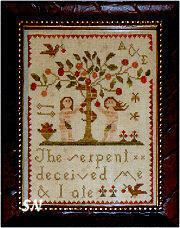 Faded flosses and darkened linen are the enemies time brings to needlework. 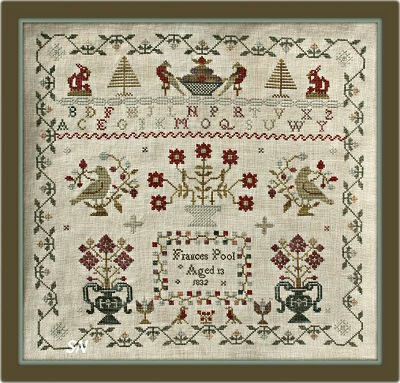 Brenda has re-charted her sampler -- lots of fabric and threads are missing from the original, and she has chosen softer colors than Frances used -- because in 2013 -- we 'expect' our reproductions to look old (and honestly, sometimes not quite like that original!!! Not a bad thing -- just an observation!) Confederate Gray, Sage, River Rock, Tarragon, Red Rocks, Tarnished Gold, Harvest Basket, Old Red Paint, Wood Rose, Wood Trail, Heirloom Gold and Otter Creek...! 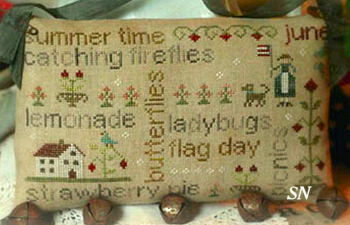 Anyway, Frances' sampler is lovely. It measures 211 x 205 stitches, is worked on Week's 30ct Parchment Linen and uses 12 different colors (17 skeins total) of Weeks and Gentle Art Sampler Threads. If you sign your name in the signature block... you can make yourself any age you want!!!!!! Offered as the chart. 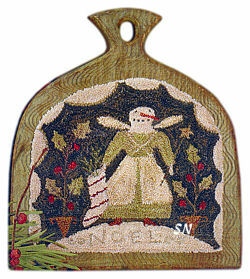 An angel with a basket of fruit -- trees, reindeer and nature in the background -- this finishes approx 10-1/2 x 7 on 30ct. All hand-dyed flosses, Brenda includes finishing instructions -- even some to *flatten* your pillow and make it LOOK OLD!!!!! 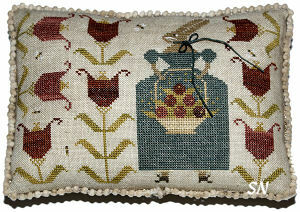 You can back the pillow in the same linen for a really aged look too! Lots of old and dusty colors in here... very pretty! 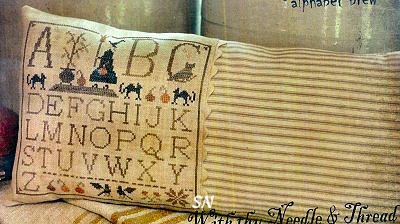 Here's another ABC Pillow chart -- matches House of Blues and Browns and Hilda'a Alphabet... THESE ARE CUTE! 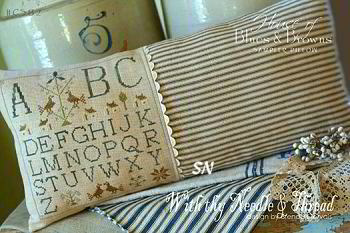 Stitch the simple alphabet panel and then finish into a pillow at least twice as wide! Find some cool lace or trim you like -- stain it if necessary -- and use coordinating ticking fabric -- YUMMY! A set of simple designs -- they stand out because they are not busy. Offered as a chart. Check out the font used for the lettering in this. 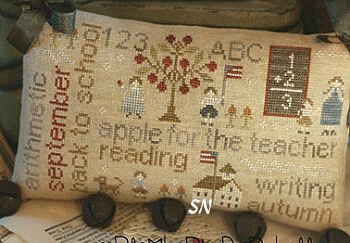 It looks scribbled... but it is actually cross-stitched over one fabric thread! 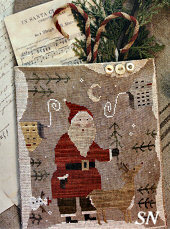 An Olde Worlde Santa with his snowman companion... maybe they're shopping for a Christmas Tree??? Offered as a chart, this is stitched on (anything you want but big in the pic!) 28ct linen in the shop. Our model makes an 11 x 18 pillow... Mona has started making an inside case of ticking that shows through the stitching linen... and it's a really cool look. Very sophisticated and fresh looking. 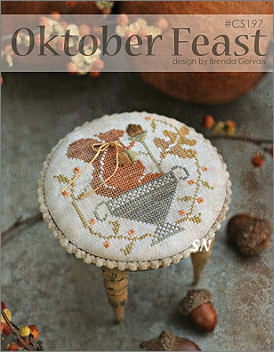 Brenda Gervais has several new designs... so here is the first! A fun, tall and skinny stuffed pumpkin... you'll need something heavy to stuff into the bottom of this, so it'll stand up. Black crows perched atop a Jack-o-lantern... I love the idea of the real pumpkin stem coming out of the top!!! 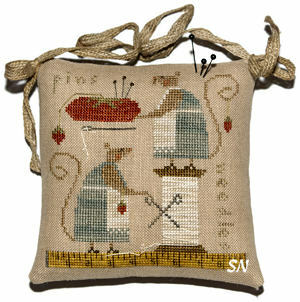 Stitched on 30ct, stitching is only 3 x and is worked in Gentle Art Sampler Threads. Too CUTE! 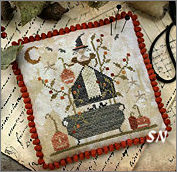 An autumnal pocket decorated with a little witch on her broom looking for her perfect pumpkin! Stitched on 35ct, this finishes a mere 5-1/2 x 6. Brenda shows it finished with a bit of homespun fabric peeking from the top -- I like the primitive X's all across the seam, and of course that rusty key is kind of cool -- probably a flea market find!!! Offered as a chart. Stitch with Gentle Art overdyeds. 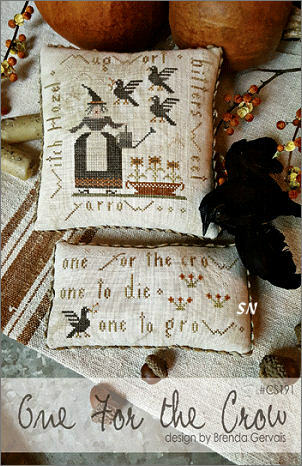 With Thy Needle has another long, skinny pillow to companion her *House of Blues and Browns*... only this one has a Halloween theme! A very clean alphabet... the top row is garnished with our resident witch, her cauldron, and neighborhood cats. The 101 x 96 stitch count design is quick to stitch with overdyeds in your stash. The pillow finishing is just the best! Get some pillow ticking fabric, find a neat rick-rack trim... and make that unusual shape that will tuck so beautifully into a pillow medley display. Offered as the chart... just cute! What a pretty set of designs! 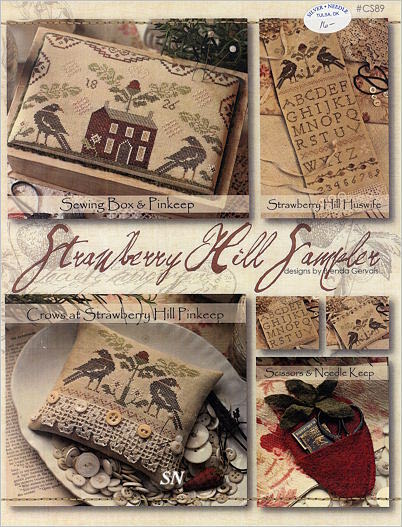 Brenda has presented us with a Sewing Box topper design, a three-fold Huswife, and matching Pin Keep and even a felt scissor case that is shaped like a little strawberry! Everything you see in the pic is included in the set of patterns... along with templates and of few of the backs of the pieces that you cannot see! 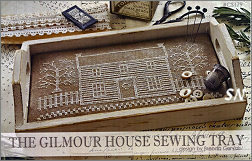 Choose a yummy linen of your liking... grab your Weeks and Gentle Art flosses, get some pretty wool for the berry and Huswife lining... some old lace and buttons for that cushion... and some chenille or rick-rack for the box topper edging... and you'll have a wonderful set of pieces to show off! Pretty colors, great instructions, this looks like a very *finishable* set of designs! 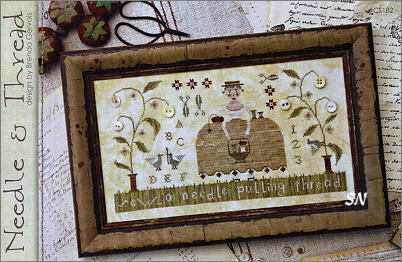 With Thy Needle's Brenda Gervais is beginning a new 12-part set of monthly designs that finish into 4-1/2 x 7-1/2 doorknob hangings. 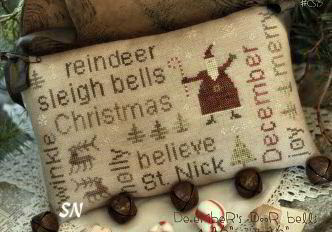 Name of the month is in here, as well as words of the season! 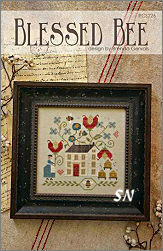 Stitched on any yummy hand-dyed you want -- the chart calls for Gentle Art Sampler Threads and one color of Weeks. Simple and real cute, stitching just a few of the motifs each time and making them into bitty cushions would be another awesome application for this new set of charts! We're starting an auto-ship, as Brenda's new releases tend to sneak up on you... and you don't want to miss any! November All the fun words of the month are packed in here! 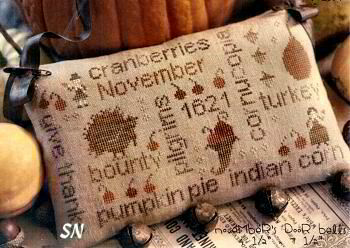 Give Thanks * cranberries * Pilgrims * indian corn * cornucopia * pumpkin pie... almost like a cross word puzzle, but with pictures! November is the second of twelve of these, offered in chart format. Stitched on just about anything you want, the patterns call for Sampler Threads. 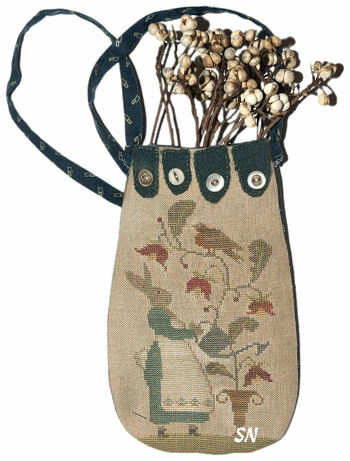 Then, to finish, Brenda made a pillow but IRONED it after it was stuffed to flatten it some, and hung rusty bells to the bottom (so this is a Door Bell! ), and attached her hanger with rusty safety pins. I'm not sure HOW to rust a perfectly good safety pin... (lemon juice or something? I didn't listen too much in high school science class... who knew it would come in handy some day!?) You know, an old cruddy silver spoon would be fun sewn onto the bottom of this too -- kind of like the old mashed potato spoon you remember your Grandma always used! Just have fun! What a fun design! 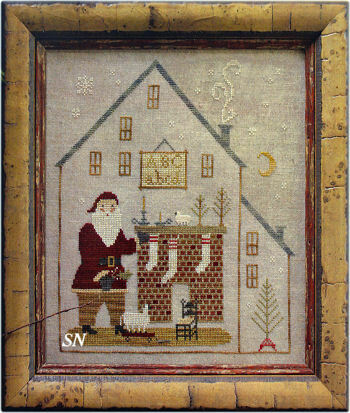 With Thy Needle has a few new releases -- this one, a chart with a stitch count of 140 x 215 is one of two that are oversized when finished. Brenda has it stitched over two threads on huge fabric -- our models are being worked in 18ct Cream linen -- to finish 15 x 24!!! You can ALWAYS stitch these a bit smaller (like 9 x 13 on 32ct!) but we liked the whole idea of a gigantic, super-simple Holiday decoration -- a full-sized pillow for a pretty guest room bed! 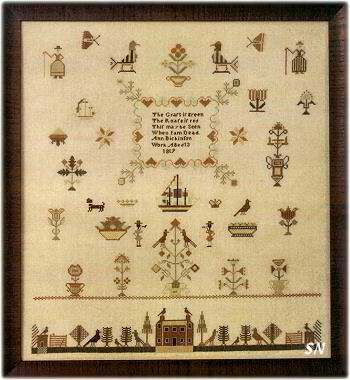 Stitched with Sampler Threads -- you're going to need a lot of thread to cover on the 18ct, but what a unique presentation. Everything is stained with walnut crystals when you are finished, if you want an antiqued and grungy look. If not, keep the crisp cream and Sampler Thread colors. This calls for Pumpkin Patch, Brandy, Walnut, Aged Pewter, Apple Cider, Old Hickory, Pumpkin Pie, Caramel Corn, Wood Trail, Toffee, Endive, and Otter Creek. Sounds more like Autumn to me! 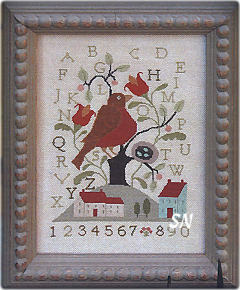 Houses, the Alphabet and sampler birds... it looks like there are only 3 colors in this, when there are actually 6 different Sampler Thread hand-dyed colors! 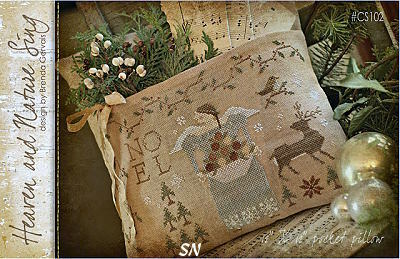 Another gigantic design -- stitched over two on 18ct Cream linen, the stitching finishes 11 x 11... so this pillow in the pic is really more like 12 x 24 in size! Going smaller with your fabric choices will produce a piece that is 6 x 6 on 32ct - so don't let that huge linen size throw you. Actually a very simple alphabet design -- I love the finishing treatment -- on a large OR small scale. Offered as a chart with the finishing details. Here's a snowman planter growing springs of holly! 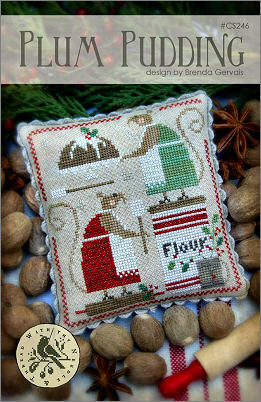 Brenda Gervais has a cute design that she's stitched on large fabric to finish into a 15-ish inch square pillow! It doesn't look that big in the pic, but it really can be if you choose an 18ct Linen! 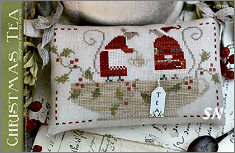 Stitched with Weeks and Gentle Art overdyed flosses, the holly berries are Algerian Eyelets worked over 4 threads -- the rest is simple Cross Stitch. Next, instructions are included to transform your originally cream-colored fabric to that mangy, distressed and relaxed look of *aged. 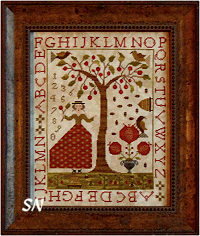 * With a stitch count of 122 x 128... this is a darling design that will look good on most any fabric you choose. Offered as a chart. 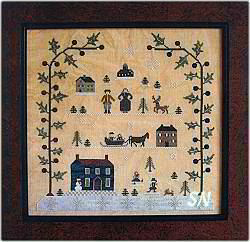 Brenda Gervais has re-produced an antique sampler she owns -- she loved the extra large house and the sweet little fox in the lower right corner. 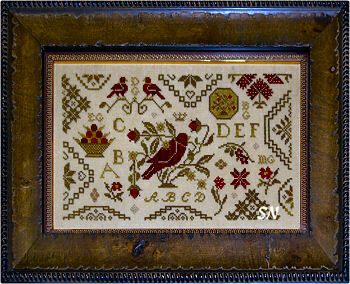 Stitched on weeks 30ct Parchment Linen, this finishes a generous 12 x 12. Elegant with color emphasis on brown and dusty blue -- it takes 5 skeins of Weeks Straw and 4 skeins of Havana. 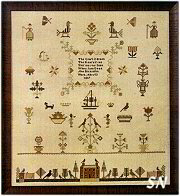 A scattered motif sampler -- the original is dated 1819. Brenda liked the fact that the bottom band's motifs are so close together compared to the rest of this piece. She also liked the verse -- which follows 18th century handwriting. The letters do not look like we want them to, so words appear to be mispelled, even though they are not. The verse does read 'The grass is green, the rose is red. This may be seen when I am dead.' Gotta LOVE that verse! Talk about finishing your stitching and shoving it in a drawer instead of framing it or finishing it! (Don't know ANYONE who does that.................!) 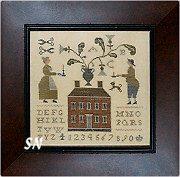 Offered as a chart, this finishes approx 17 x 17 on 30ct and is coded for regular DMC. 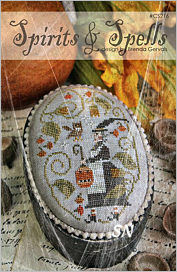 Hey, The Witch Hazel Sampler has a Christmas counterpart! Here is Santa, complete with his Reinsheep? Just like Hazel's piece, you get the cool scattered alphabet cluttered with a few motifs here and there, and then the most charming paper border treatment! The scallops around the edge are sheet music! Brenda gives you instructions in here for taking perfectly good sheet music, distressing it, and making it kind of old and mangy looking. 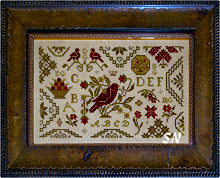 Cut it out, and attach to your needlework, then frame -- such a cool antique-y finish! 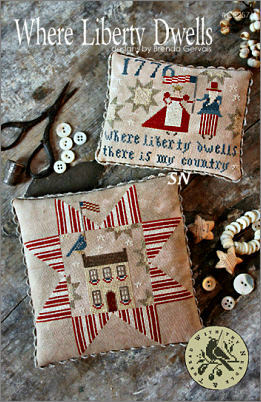 Her finishing ideas really add a touch of creative flourish -- so her pieces are fun to stitch and display. 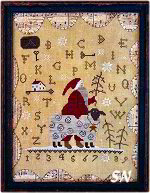 Offered as a chart, Merry Christmas to Ewe is 134 x 155 stitches, and is worked on Weeks Straw 30ct in luscious Weeks and Sampler Threads. 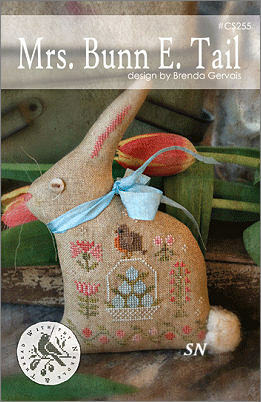 Bunny & Co has been published in Punch Needle, but is now available in Cross Stitch, as well. 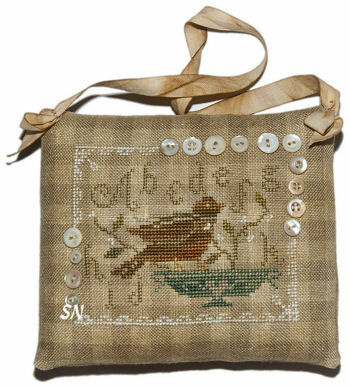 Stitched on Weeks 30ct Baby's Breath hand-dyed linen in 14 different shades of Weeks flosses, this finishes approx 10 x 6. 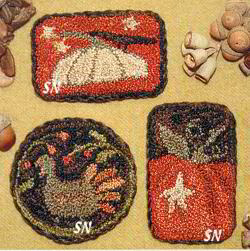 A simple, but charming design, the stitching is easy, but really quite comanding! 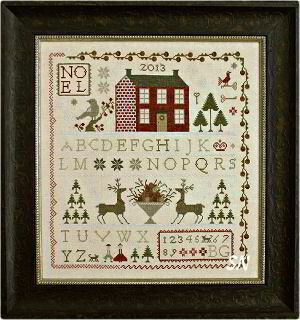 A darling design...this one measures 90 stitches square. Choose any fabric you wish, there are instructions in here to coffee-stain, if you want, as well. I love his little bunny head disguise on the stick! Charted for 11 different colors of DMC floss. Another charming shaped sampler, this one finishes approx 4 x 5-1/2, and features the distressed and baked antique sheet music paper treatment. 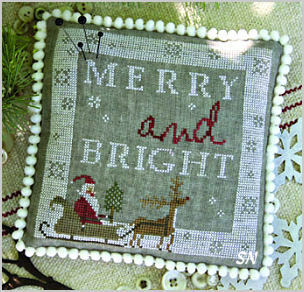 Almost no stitching at all, what a neat way to display just a hint of cross stitch nestled among your Christmas greenery! Offered as the chart with all the finishing instructions. This is a stunning piece... it finishes a mere 5 x 7-1/2 (over one) on 28ct Platinum Linen but uses 26 different DMC colors for its petite presentation! 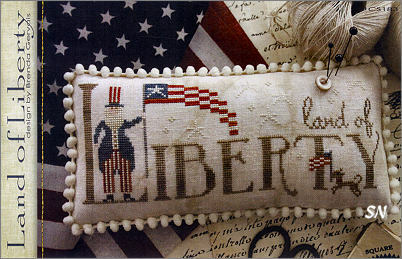 OK... it's OK to stitch it over two threads, too! Very Early American in feel to me, very classic and clean, wouldn't this be pretty in a foyer or bedroom hallway? Chart format. Well... you certainly won't want to eat this piece of Candy Corn! She needs to decorate the full bowl, though! 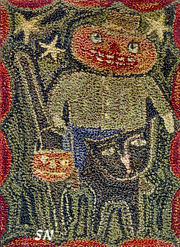 Offered as a chart, this is stitched on Weeks 30ct Gold Linen in 10 shades of Weeks overdyed flosses. 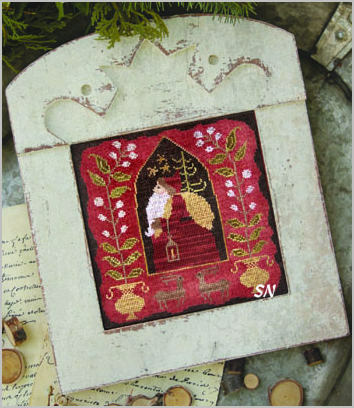 She finishes a generous 4 x 6-ish size... so you may want to use 40ct instead, or stitch her over one of the 30. Cute, a very different finishing idea. 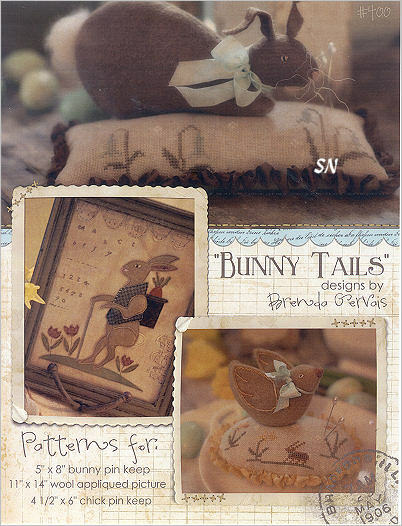 Oh this is cool, the pattern includes a 5 x 8 Bunny in the Bluebells pin keep, an 11 x 14 B is for Bunny wool applique picture, and 4-1/2 x 6 Spring has Sprung chick pin keep! Upon opening the pack, you'll find an AWESOME color image of the finished wool pic, all the actual sized templates for that pic as well as the bunny and chick that sit atop their stitched cushions. The little bits of cross stitch are done with Weeks flosses; charts are included for those, too. 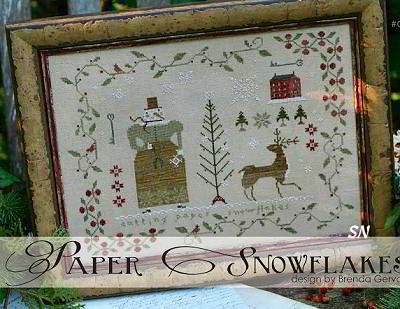 Brenda even tells you how to *make* the distressed sheet music paper that decorates the picture! What a treat this set of patterns is!!! 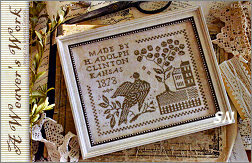 Finish, and add an old photo or ticket stub, or package of antique needles or buttons. 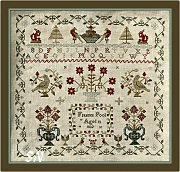 Offered as the chart, this finishes approx 6-1/2 inches stitched on 40ct. 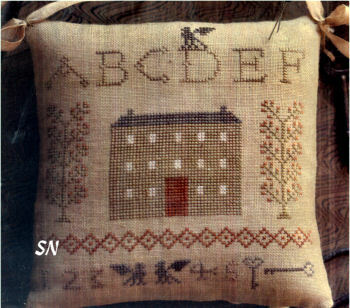 A small spot-motif sampler complete with scattered alphabet, a trio of pumpkins and little turkey, this is worked with Weeks hand-dyed flosses on 28ct Flax Cashel Linen. Add a little of Brenda's coffee-staining, and you're finished! Approx 5 x 6-1/2, offered as the chart. Stitch a 6-inch Christmas Pear! DMC flosses, wool leaves, coffee distressing... choose a bit of vintage yellow-y fabric for the back, this is a cute little piece! She even used a real pear stem on the model! Chart and how-to directions are all in here! 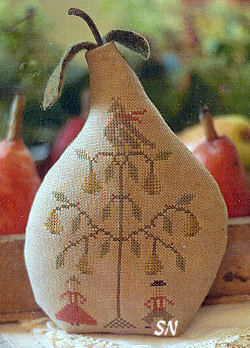 The design is on 28ct Flax linen using Weeks over-dyed flosses. It finishes approx 13-1/2 x 8. 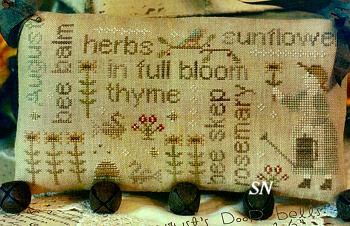 'She seeketh wool and flax...' the tiny motifs scattered about include houses and the barn, along with a few sheep scheduled to be sheared!!! What a cute little egg! A 7-Inch Pin Keep, this is worked on 35ct cream linen using Weeks Dye Works over-dyed flosses. The top portion is simply little single Algerian Eye stitches here and there. 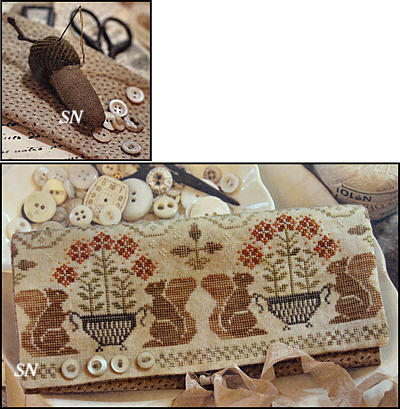 The bottom portion is a bunny band sampler. 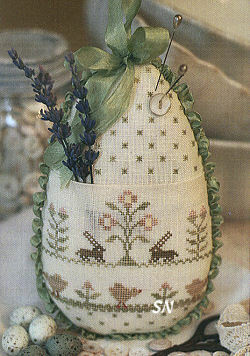 When you make the ribbon-trimmed egg, notice that you are folding over the bunny linen, to actually make a pocket on the front of the egg. Simple and fun! Offered as the chart, with finishing instructions. Brenda Gervais has new cross stitch designs that are just like no others! 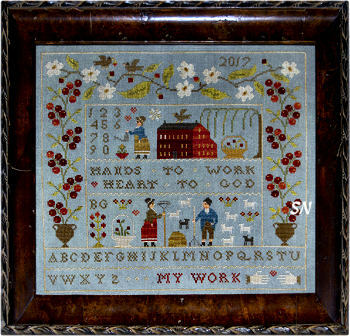 I wish this verse were charted... (It is in the package... and I bet you could chart it), and add it to this piece! 'Jolly Wolly pumpkin head, you're happy, tell us why? 'I'd rather be a pumpkin head than a pumpkin pie!' 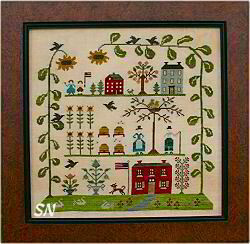 What a fun little farm scene with that big blackbird flying over the sunflowers! Stitched in regular DMC flosses, this finishes approx 8 x 8-1/2 on 32ct. 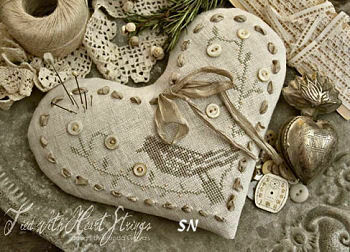 Brenda Gervais has a charming new primitive heart design that is stitched over one thread on 28ct, and then finished into a stuffed heart. She shows it perched atop an antique oil can, but a neat old thread spool would be cool, just anything you could use as a stand. Simple Cross Stitches, she even gives you the instructions to make the little wool strawberry hanging on this! (It calls for a rusty safety pin to attach it!) 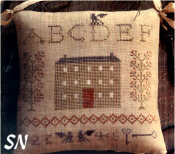 Anyway, just a neat application for your needlework... I could see lots of smaller things finished like this -- a creative way to display! 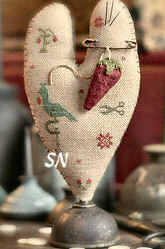 Heart Pin keep finishes approx 7 inches tall, offered as the chart with instructions. 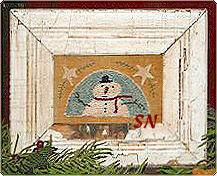 Here's a primitive Santa... kind of larger than life (looking at the house and resident snowman!) But... I guess that's how we all remember Santa to be from years ago, when we couldn't wait for him to come!!! 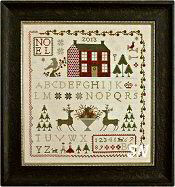 Part of the charm of this cross stitch design are all the dis-proportionate shapes and sizes that fill the spaces. The colors are simple DMC, the fabric is 28ct Platinum Cashel, and finished size runs approx 4 x 5. The chart inside this package is AWESOME! It is a full color chart, printed on an 11x 15 piece of paper... it's so pretty that I want to just hang it on my wall like a poster! There are even instructions included to coffee-dye your Santa to make him grungy and mangy -- to match those grungy and mangy black candles in his sack!!! Offered as the chart. 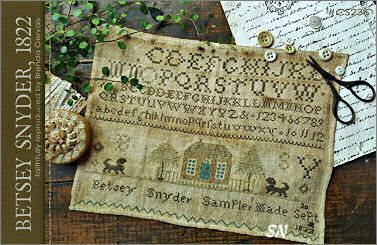 Here is a trio of very simple, primitive sampler designs that is finished so creatively! 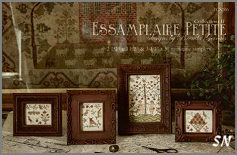 Offered as three individual charts, each one is on the small side, but assembled into endearing little shapes! ABC Pinkeep is a bird, perched on an old Singer Sewing Machine oil can. (You may have to get creative when you're out searching for your bird base!) A 4 x 3 sampler bird, its stitched in DMC flosses as well, and is holding a small wool strawberry in its mouth -- instructions include that template, too. 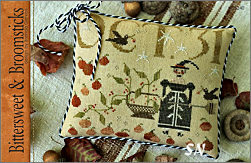 Finally, Gathering Acorns features the sampler bottom and a fabric cap. Stitch count on the acorn is a little bigger than its counterparts -- 88 x 99, so you may want to stitch all three on the same OR different fabrics. 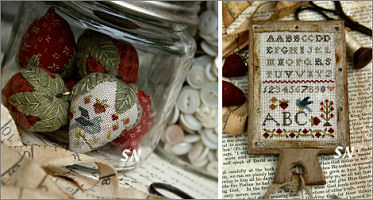 I just love the idea of stitching these tiny pieces, and then finishing them into the various shapes. 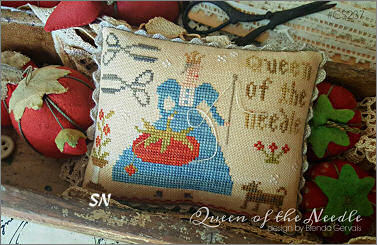 What a cool, unique way to treat your needlework! What lovely things to tuck into a medley of samplers. You could actually use them as pin cushions -- very untraditional ones, at that! 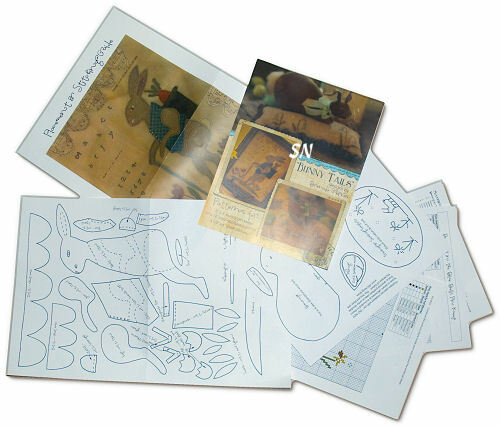 All are offered in chart format with finishing instructions and actual sized shape templates. 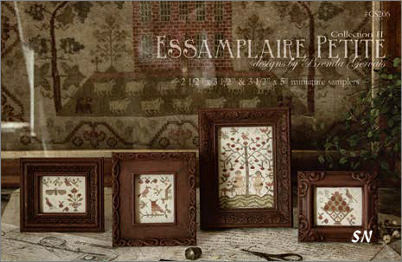 This is a collection of 6 petite samplers -- just enchanting! Offered in a chart-pack, each 60 x 70-ish piece is charted in color on it's own page, using regular DMC flosses. 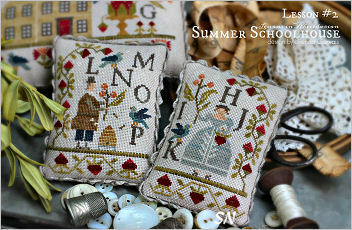 Simple designs, very traditional, small and quick to stitch, you can execute these on almost any fabric you wish! 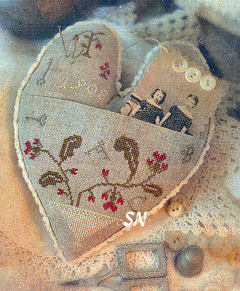 Two new "Sampler Things" as I like to call them... Brenda Gervais has a precious new sampler that is finished into a little stuffed heart! 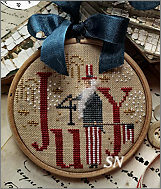 Stitched on 28ct linen in DMC flosses, simple letters and tiny motifs are stitched, and then she gives you directions to further distress your stitching with coffee staining! Simple instructions to sew into a heart shape... you'll want to find an old, dirty key lying around somewhere -- that adds lots of charm! Chocolate Bunnies is the same idea -- the eggs finish a turbo seven inches high!! Such simple ideas, not much stitching... but along with her acorns, cats, sampler bird and little pineapple.. I think these are SO cute and unique! Display them in an old wood bowl! 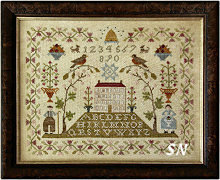 Something a young girl would have stitched in school, this finishes approx 5-1/2 x 11 on 28ct. 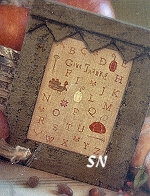 A 6-inch pocket with an alphabet front, actual-sized templates included -- pretty for dried herbs, this is worked on 32ct. A tiny thing, this finishes approx 3-1/2 x 4 on 32ct, stitched in DMC floss. This is a darling black cat, complete with GHOST ghourd pail! 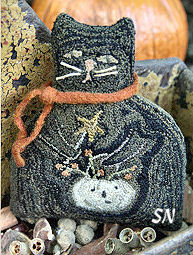 Only 5-1/2 inches tall... you might have to work at keeping the finished kitty away from YOUR kitty! Finishes approx 5 x 5-1/2, punch this so the sky follows the curved contour of the hill and top of design. The pic is a great reference! She's an angel punched in sage greens, aged white, and dark reds! Finishes approx 5 x 5-1/2. Finishes approx 4-1/2 x 6-1/2, just a couple of snowmen out for evening!!! Choose a neat blue-black overdyed for that night sky, and consider a touch of opalescent mixed in with your star color. A Spring Bunny tending the blooms -- for a future meal? Change the dress color is the blue seems too bright... Finishes approx 4-1/2 x 6. Quite a dramatic piece, this punches approx 4 x 5-1/2. 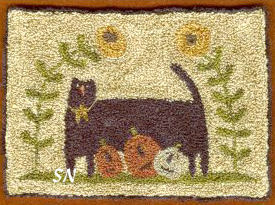 The overdyed colors seem to contour -- they follow the outlines of that grand cat, and the pumpkin man. Very festive for Halloween!